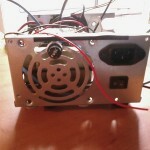 Update: as a follow-up to this project, I have upgraded my power supply to a new digital design. 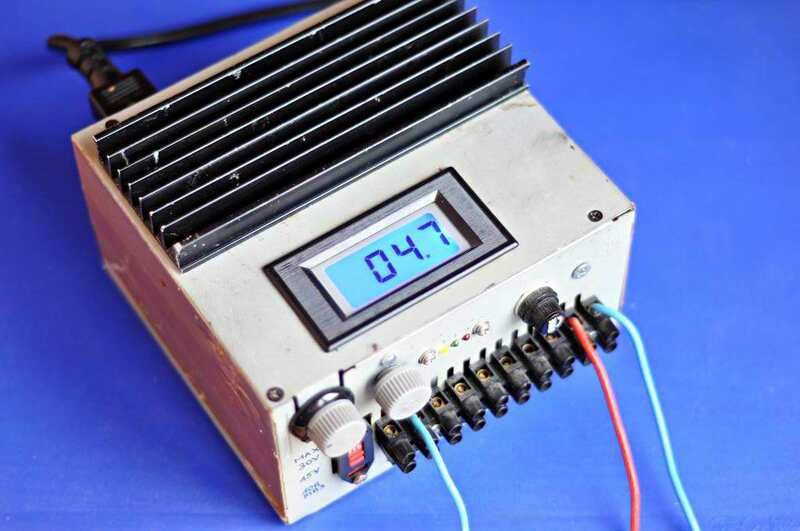 Having a variable regulated power supply that can output precise voltages in the 0 .. 30Volts interval is a great add-on for any electronics lab. Especially when it’s a high power supply that can handle as much as 20Amps of current. 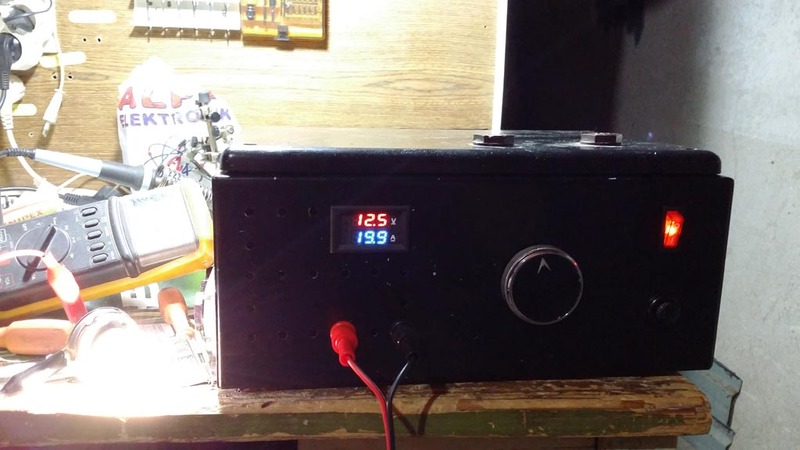 For this article, I’m going to show you my variable regulated power supply, built from scratch, the circuit diagram I’ve used and a few safety tips. 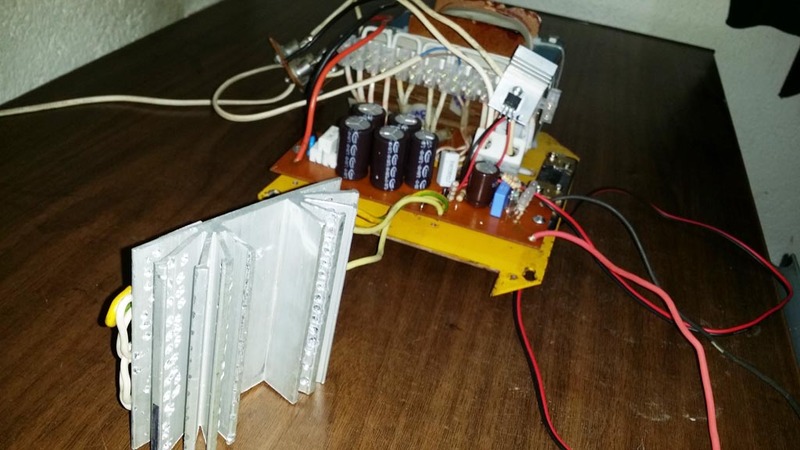 It’s based on the LM317 that controls a few high power bipolar transistors connected in parallel, to achieve a 0..30V voltage interval and a maximum current of 20Amps. 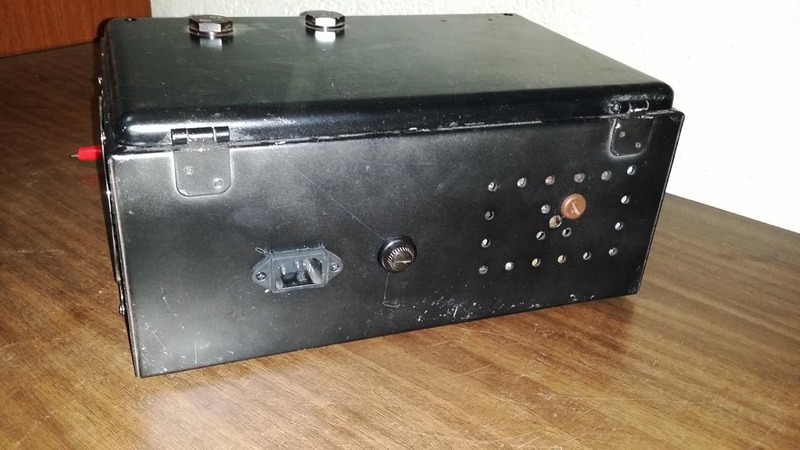 For the project enclosure, I opted for a computer power source metal casing, scrapped from a defective unit: little space but eventually there was enough to fit everything inside and still keep it well organised. 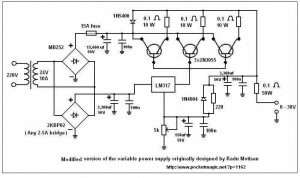 The low power secondary would be used to obtain 12V and 5V with the L7812/L7805, to power the digital voltmeter applied on the high power secondary and also various microcontroller projects that don’t require too much current. I’ve soldered everything on a test board, using tick copper wire were needed (eg. 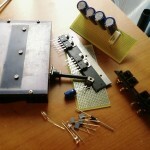 for the connections to the transistors). A few holes in the front panel and I was able to place the 5k pot for coarse voltage adjustments (and a second 1K pot for fine adjustments, connected in series with the first), the LEDs, the fuse, and the black array of wire connectors for the output (The variable regulated output, the max regulated output, the non rectified alternative current output, the low power 5V and 12V output, etc). 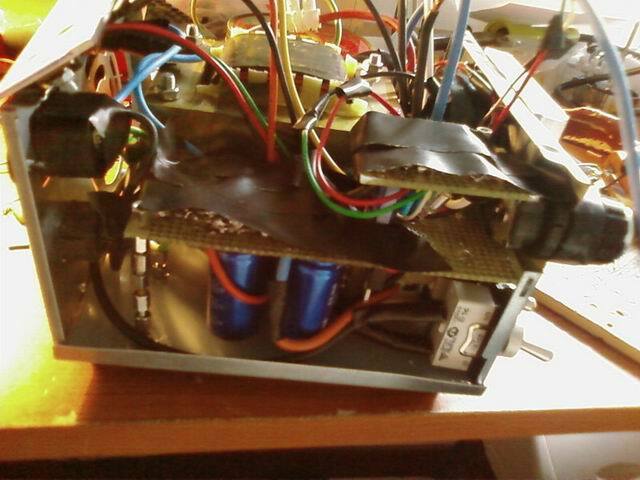 My transformer gives 10A max at 24V, but the regulator block can handle up to 20A max, because of the 6 transistors. I preferred adding a few extra transistors, to distribute the load and help dissipate heat better. 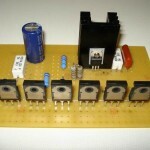 If you need more current or less, simply change the number of transistors to suit your needs. This supply is extremely reliable. 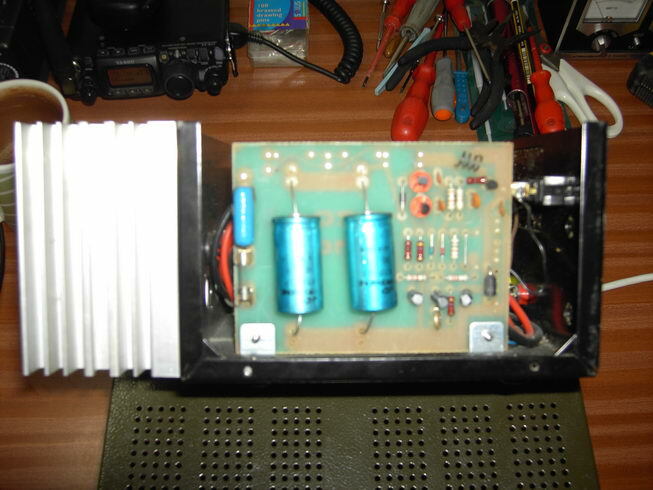 I’ve used it for more then a year now, the initial design had 4x 2N3055, but they failed quite frequently because of my high voltage experiments that produced spikes transmitted back to the supply circuit. The TIP3055 seems to be almost indestructible, so I highly recommend it. 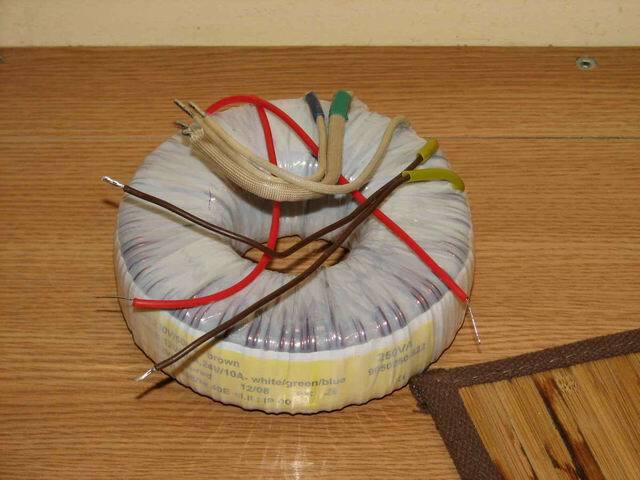 The neon bulb works as a snubber, to protect the supply against high voltage kick backs. I’m not sure you need that if you’re only doing low voltage stuff. 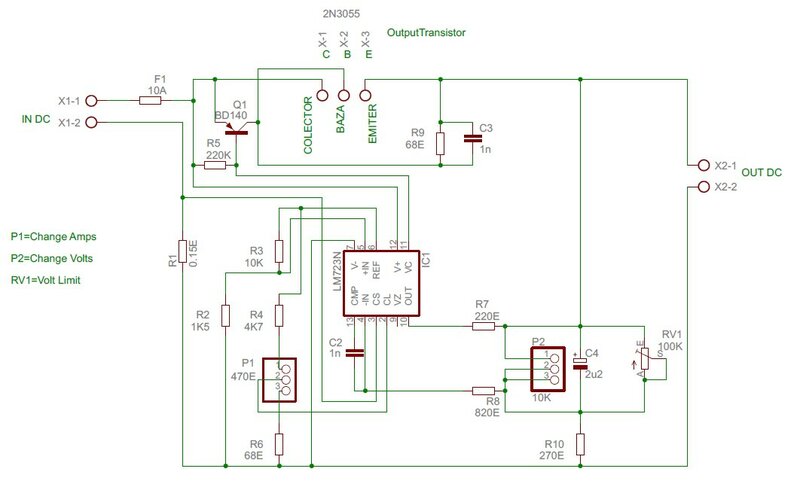 As a common effort of several people, this circuit diagram comes with several improvements. You can read the comments below for more details. Instead of the 2n3055 I recommend the TIP3055. 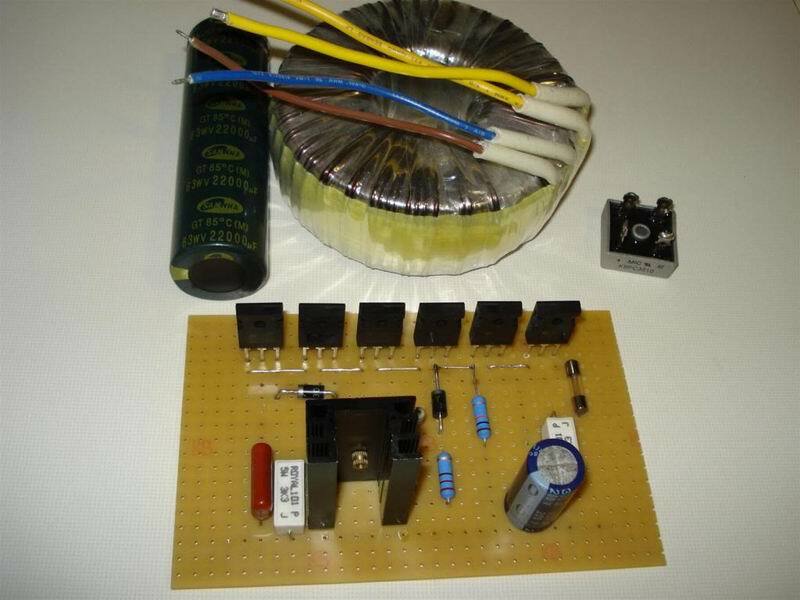 Phil provided several helpful advises (see comments section) for others willing to build a power supply. He also experimented with multiple circuits, seeking for the better alternative. 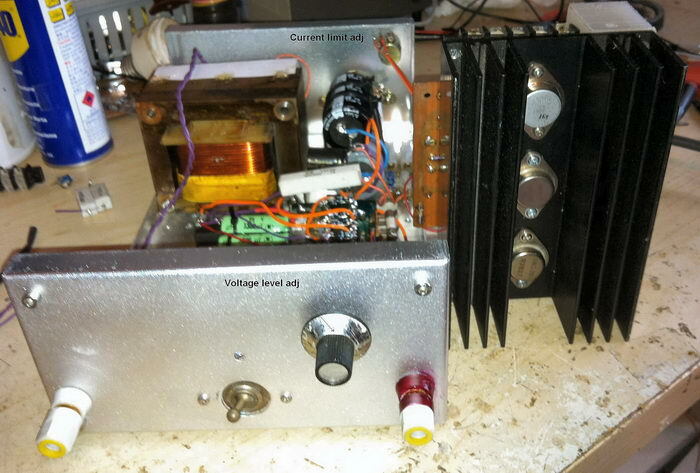 As a follow-up to this project, I have upgraded my power supply to a new digital design. Read more here. 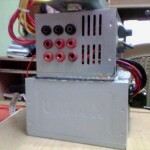 For switched power supplies, see this article. 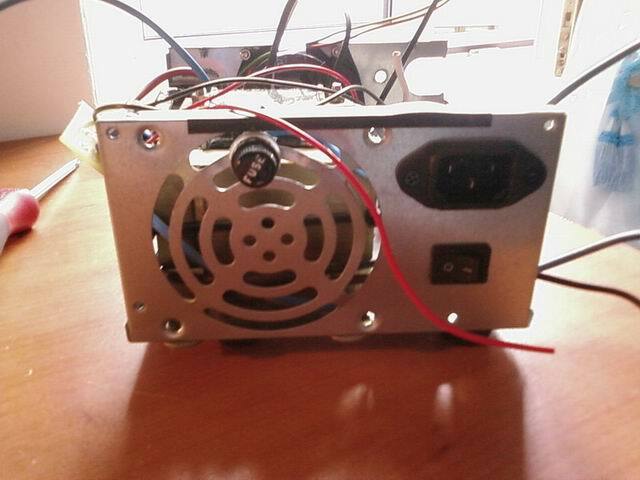 can this power supply be used to charge a car battery with 12Volts 100AH to 120AH rating? Hi Blade. I suppose it can. Very nice information, I think it is useful to us. Thanks. Super circuit that i still used in my reverse electrochemical oxidation of Gold refining setup & precious metal refining chemistry with slight modification. Thank you. I am an Gold refining chemist. Technical info available gold refinery. Would love to see some pics of your setup, can you upload them? Hai Radu Motisan ,Thanks to readout my info. Soon i will upload all the info and pictures .please wait. Hai Radu Motisan Soon i will upload all the info and pictures .please wait. 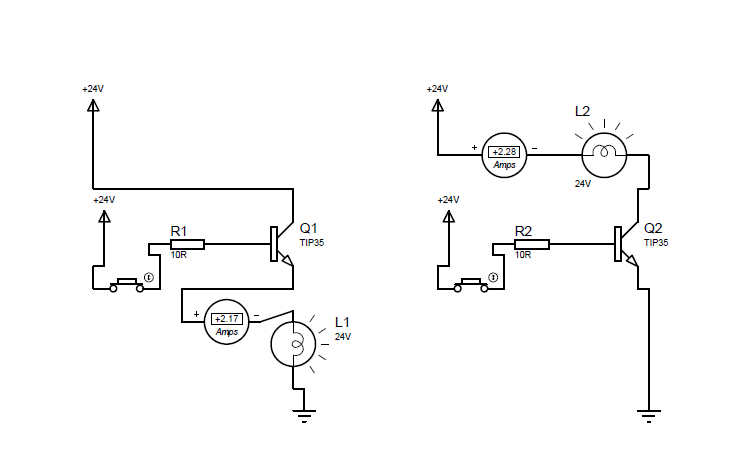 My transformer has a middle tap, so it gives me 0-12-24, I’m using the switch to rectify the 0-12 or the 0-24 output. you don’t draw those switch on the design. where do you put it? can you explane me it better please? 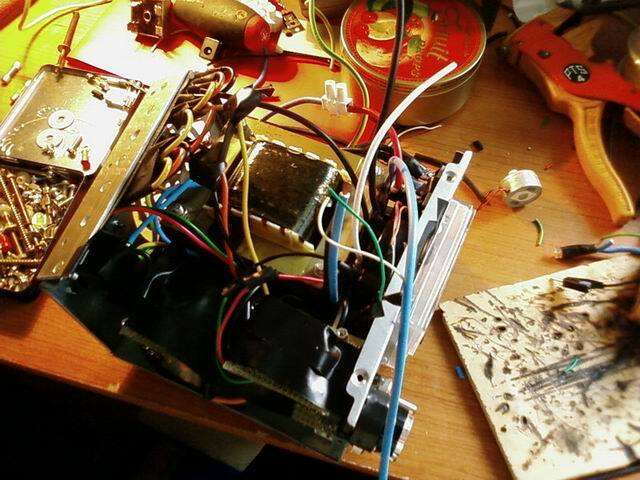 Borys, you don’t need the switch, please forget about it, it was only needed for my particular transformer (because it has two output voltages 12V and 24V so I can select which one to be rectified). 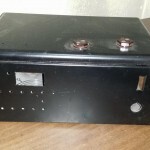 1) where do you found a 22000uF 50V capacitor? it’s a very big and maybe a lot expensive capacitor? 2) On teh design there’s a neon. do i need it? why do you put it there? 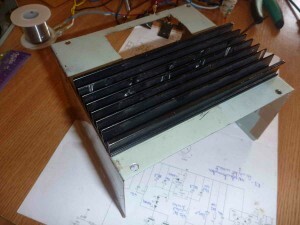 Hi Borys, I was unable to find a 22000uF capacitor so I used 4x 4700uF/50V capacitors connected in parallel. The price for all 4 was aprox. 6USD. You would need the neon only to protect the supply from High voltage spikes, I use it for High voltage experiments, but maybe you won’t need it. ok i undestand. 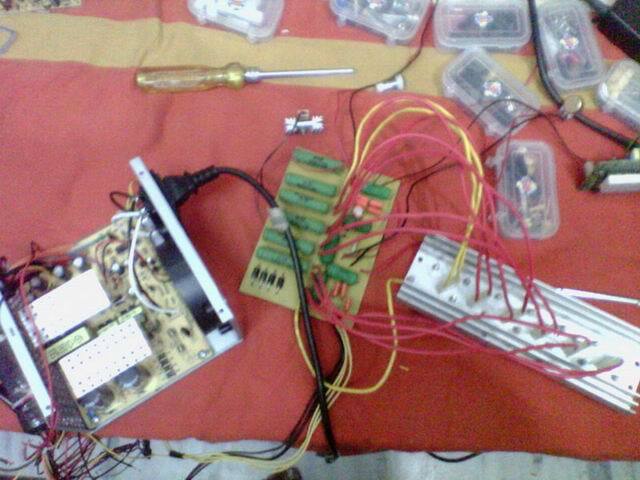 i don’t put those neon but some diodes betweem the voltmeter and the fuse. Ok. Put some pictures of your setup when it is done, I’m looking forward to see it. i’ve got a lot a problem because i don’t know where bring some things. today o found a transformer 22oV to 27V in the dump near my town. do you think that it’s ok for this project? i don’t khow how many current it give me because i cannot find it on the web. it called “cecla 38675”. can you try to search it please? 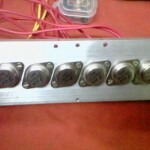 Please measure the Iron Core size, and also put a few pics with the transformer. can you see the secondary wire? can you guess how tick it is? Only a guess, this should give you 10-15 Amps. anyway i’m goig to return to the dump to find the other components or another transformer. how many languages do you speak? do you now russian, ukrainian or italian? one question. if your transformer can give you 240VA max how can this power supply give me 600VA? My transformer only gives 240VA, but the Rectifier+Regulator can handle up to 600VA. I don’t know Russian, neither Ukrainian, but I know a little Italian. again, my transformer only gives 240VA. 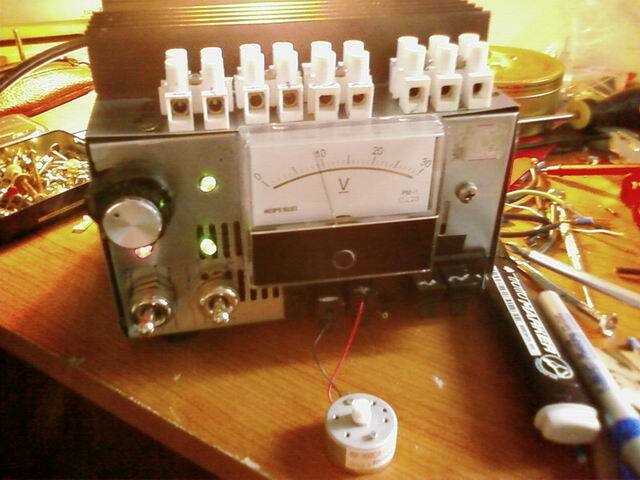 In the regulator, I’m using 6 Power transistors, so this block can handle 600VA max. But the output in my case is 240VA . can you show me on the design where you connect to have the max dc output and the max ac output please? i want to know how you can have the max regulated output and the non rectified alternate current. for example if i want the max regulated output i have to connect two wires betweem the 22000uF capacitor and lm317. am i right? Yes, you can tap right after the capacitors, and have maximum rectified current. For alternative current, you can tap before the rectifying bridge. ok, if you have any questions, ask. you can take the neon bulbs out of voltage control probes (those for 220V, they are very cheap). Hi Borys, C1-C4 are just simple filter capacitors. You can use any 50V 0.1uF cap. But if you want you may exclude them as well. They are not critical for this supply. what is the diameter of wires that you use there? and of your transformer? because i think that those of 1mmq are too little (my transformer can give me up to 20A) and those of 2mmq are too big because i cannot bend it very well. 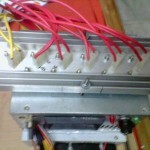 can i use the 1mmq wires? I think 1mm is too little. Better use the 2mm (or 2.5mm) and use pliers to nicely pack the wire inside your construction. If bending is still a problem, consider using stranded wire. It’s easy to find it at any electrics shop. Sound very promising! Put some pictures here when it’s done, or if you need I can give you an account on this blog to put all the details in a separate post. If my requirment is of only 2 amp. for 0-30v What capacity of transformer should i use. & how much power transistors should i connect. Please advice. what is the name of the programm that you use to draw your design? Hi Borys, I will check it and get back to you. Here i am! I made it!!! Can any one tel me how to do that? 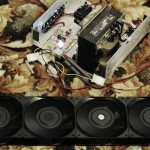 Hi Radu, I like your design and simple to follow instructions! 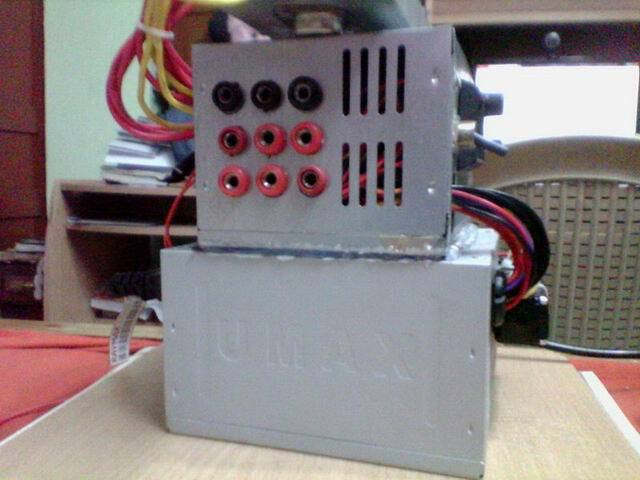 I hope you are still answering to this thread, I have been looking around for a 240v input 28v 30A max single output psu design for a while as to buy on is far too expensive, what changes to your design would you recomend for this output? Hi Phil, I get email notifications on comments. 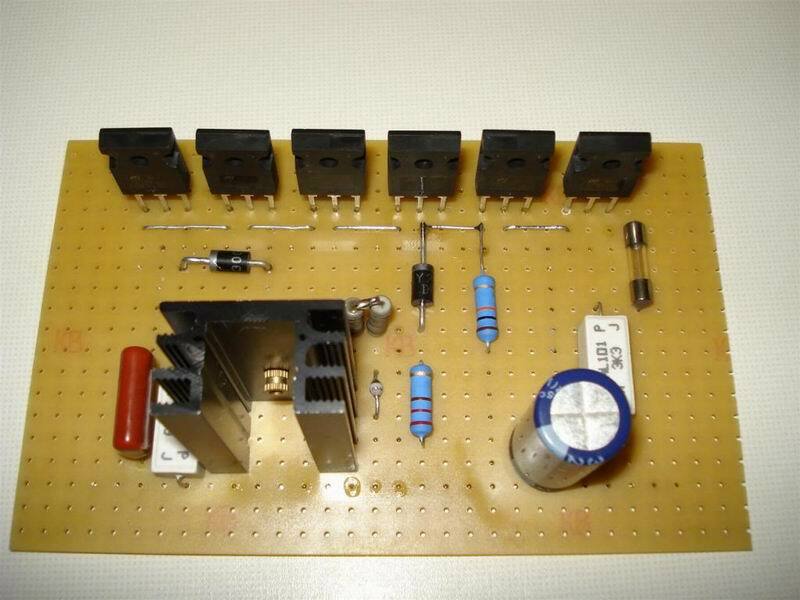 I would use at least 8 power transistors in parallel (TIP 3055) on a very large heatsink ( 20cm x 10cm). 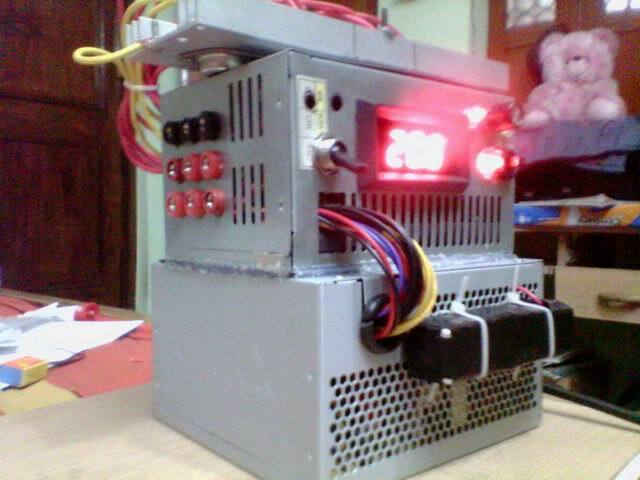 i made your power supply but do you remember that i’ve used a 230v to 27v? when i retify everything i’ve got 42v dc max and on the datasheet is wrote that you can use the tip3055 not over 40v. i think if i reduce the capacitor to 4700uF i’ve got 36v dc max. i am right? 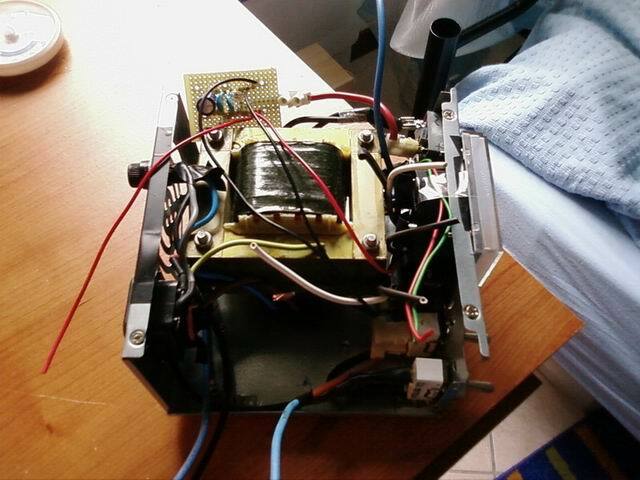 Hello, your article has been very helpful, however could I substitute the transformer with a PC power supply that outputs 12v? What about one that outputs 5v? Assuming that both have enough current capacity. 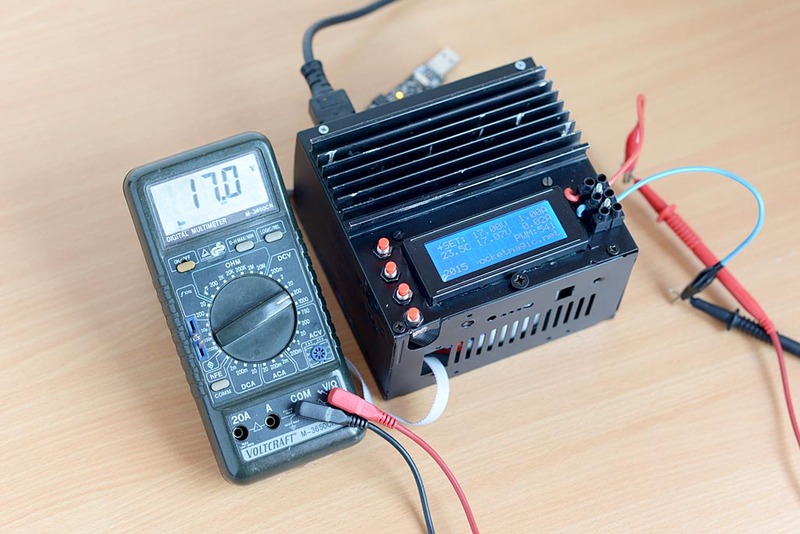 Thank you Radu, just had a look at my redundant spare zetagi 13.8v 25a radio psu based on 5 old 2N3053 mounted on a massive heat sink at the rear, its not a great psu but it can be internaly regulated up to +26.5v and has a very large iron core giving +28.6v at the bridge rec. Another bonus is the case is pre cut under a plastic front cover for a front fuse holder, meter and variable pot. so half way threre already. Hi Phil, that’s great, feel free to post some pictures when you get the chance! You can use any set of high-power bipolar transistors for this supply, with small variations in the output based on transistor model. 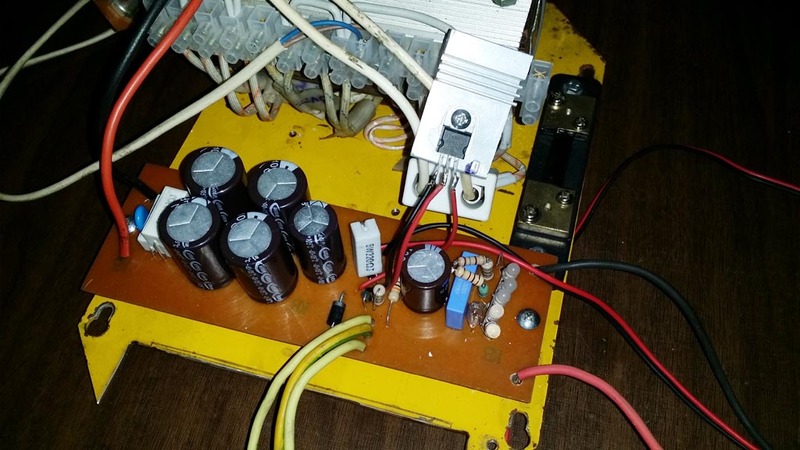 Initially I was using 4x 2n3055 but because I was powering some high voltage inverters with voltage spikes, the transistors were failing very often. 6xTIP3055 seem to do a better job. 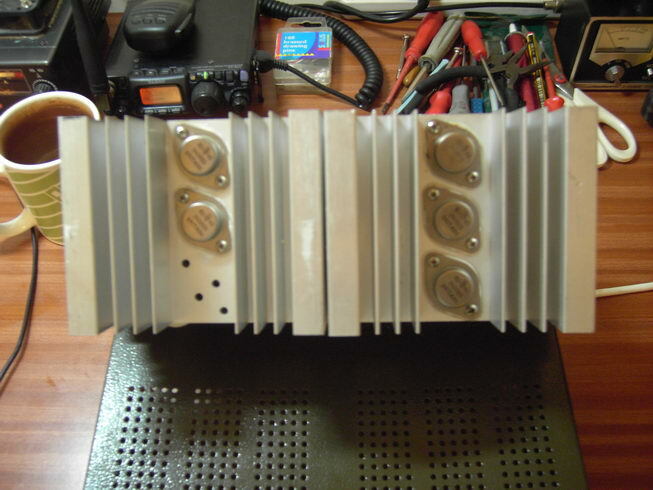 Cheers Radu, this is for radio use when testing a 28-30v 250W HF/VHF commercial and military grade home brew linear amplifier. The plan is to use whats available and keep the cost down as I am disabled and not working at the moment, It would be a tight squeeze to fit 8 TIP3055 on the heatsink but 6 TIP35c will fit ok.
Ive got the parts shopping list together and its looking good, there are some nice combo volt/amp digital panel meters available on the internet now but the price is a little too high for my pocket although I do like the idea of a current reading at the touch of a button, I will photograph the build stages as I advance but it will be a slow build due to my circumstances lol. 4 x C1 to C4 on bridge rec. 0.1uF are these standard disc ceramic and what voltage rating recomended? 1 X 220 ohm res on adjust of LM317 is this 1/4w 1w 2w or higher? 1 x 10k res from base of power transistors 1/4w or higher also the LED and neon res? Do either the 10 ohm 2W res on the LM317 output or the 10K res on the TIP3055 base have to be metal film or is wirewound ok.
all the resistors can be 1/4W unless otherwise specified, eg. there is that 2W resistor. The LED can be any led, there is no tight requirement here, the neon you will probably not need it, I sometimes use my supply with high voltage inverters that can kick back with voltage spikes, that’s why I used the neon. But for general use, you can skip it. The 2W 10Ohm can be either type, since this is a DC circuit. For any other questions, I’m happy to help, just post them here! Good luck, and have a better New Year! Anybody know of any general use easy purchase alternatives please? Phil, you can go for 1n4007’s (D2,D3,D4). Hallo, nice works! I want to realize this amazing project,however with less power. -How much TIP3055 must I use if I need only 4A? -How much current add every TIP3055? -Can you suggest me any D2 (FR302) Equivalent? Hello Heinrich, use 1n4007 instead of D2. It will work. Regarding the current, what are the parameters of your transformer? For 4A, you could use 2x(two) TIP3055. Hope this helps. 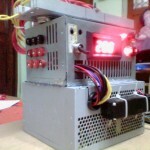 My transformer is a 120VA with 2x15V output. So,every TIP3055 add circa 3A of maximal output current? TIP3055 can dissipate 90W up to 25°C, and a lot less after this threshold. It can withstand a collector current of 15A max. 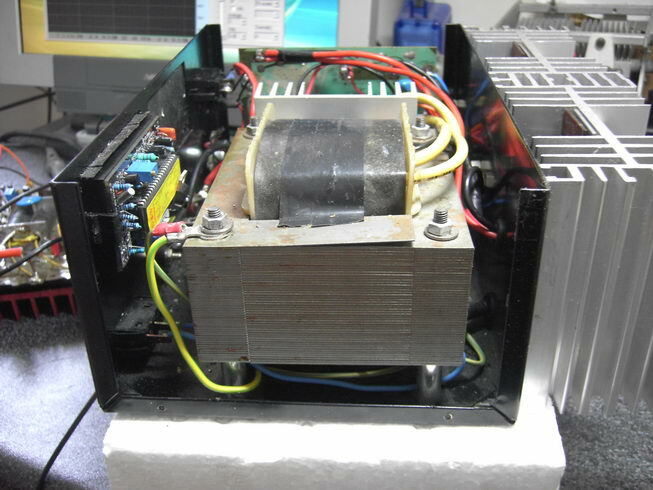 For 30V, one TIP3055 should be able to handle 3A (30V * 3A = 90W) IF A GOOD HEATSINK is provided! 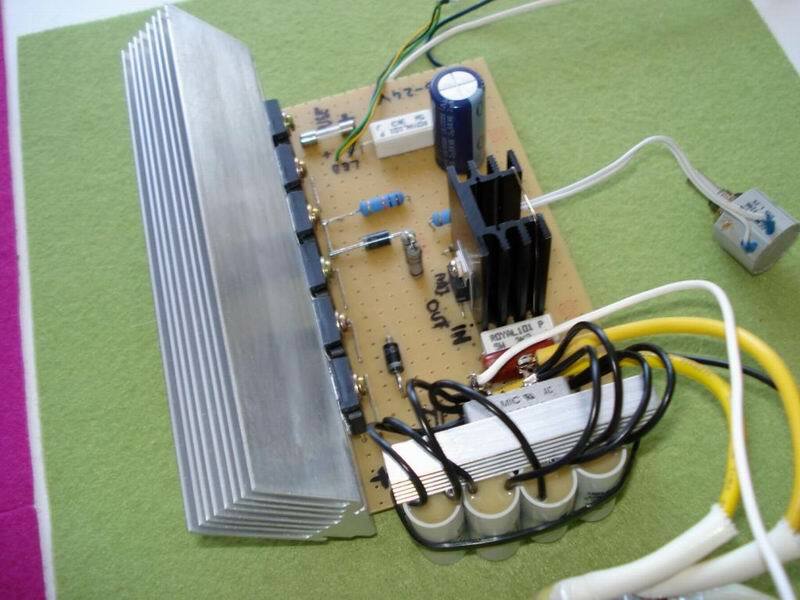 For 15V, one can take as high as 6A, again, with a big heatsink. 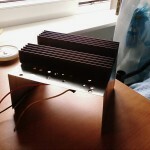 To minimize the thermal stress, and to require a smaller heatsink, you should use two (or more) in parallel. By doing so, each TIP3055 will take a proportional part of the current and the heating produced will be smaller (safer for the components). I have some questions. 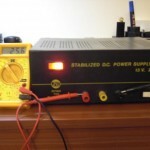 How much is your max dc and ac voltage? Up to now i have broken 2 tip3055 because my max dc was 42v. I have red on the datasheet that the max voltage collector emitter musn’t be more than 40v. Did you ever broke one transistor? Have you got any idea? @Borys, my AC is 24V . 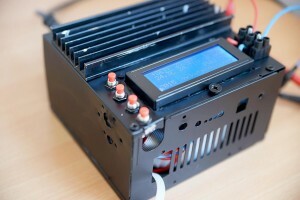 The rectified DC goes up to 32V. I’m using TIP3055. A while ago when I was using 2n3055, and doing high voltage inverters, powered with this supply, I sometimes got burned transistors because of over volted spikes. 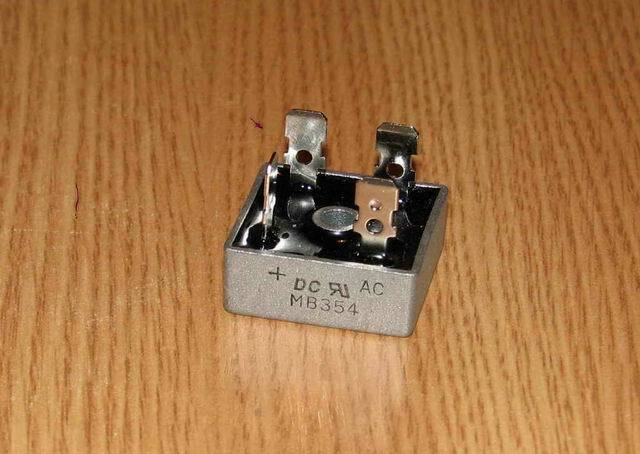 Since then , using TIP3055 , no transistor was burned. Note that note all the 2n3055’s are the same, some of them have a last letter identifier, and the ratings are different. thank you for your quick answer. now i retry to remake everything but now i modify my transformet and i have 24ac instead of 29ac but when i retify i have 35v instead of 32v. i think that is not a big problem for tip3055. 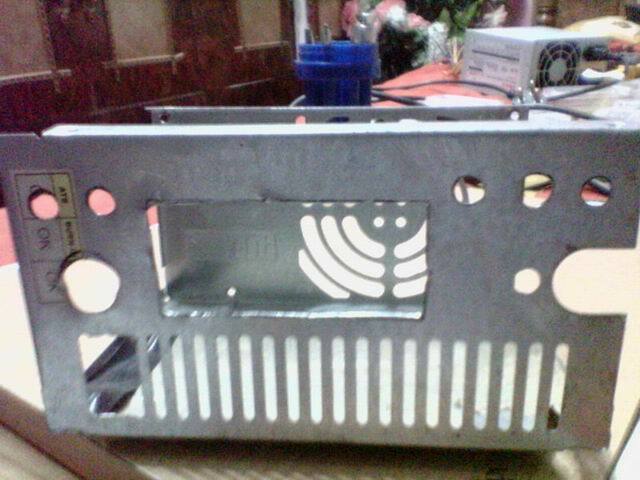 i remake for the third time my power supply but for the third time i have burned one of 6 transistor. my dc max is 32,7v. maybe i stelled bad they or the temperature of my welder is too high.have you got any idea or any substitute for tip3055? Borys, sorry to hear that, can you post more details like what exactly you did when the transistor burned? 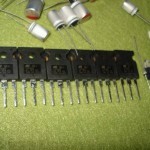 For a substitute you should look at other high power NPN bipolar transistors. I’ve bought a big torodial transformer and I’m going to attempt to build this supply. @Lukas: very easy! also you can ask questions here, and me or other can help you. @Borys, sorry didn’t see your comment before. It happened to me to burn the LM317 once as well. How is it working now? Hi Radu, here is an update on my build, I was having lots of problems getting this to work after building so I dismantled and started again only to find I have been supplied with a LM3171 instead of a LM317 I hope no other damage has been caused to other components, this only goes to show never trust suppliers and always double check all components before construction, oh well starting again. PS. 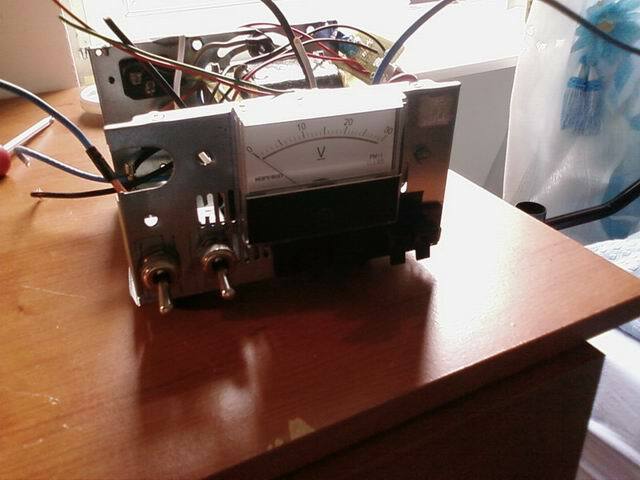 the combination volts/amps digital meter I purchased from china fits the case perfect and works lovely but the current shunt to handle 30A is quite big and took a lot of work to fit to the power board but it does look good. Hi Phil, that’s great. I’d love to see your setup when it’s done and maybe to include your own version in the article above. May I ask what type to volts/amps meter did you get? Can you post a link? HINT! ask him nicely and he will ship reduced declared value so not to get stung by customs and import duty, worked for me folks. Sure, Borys, You can post it. Well three times I have blown the LM317 at switch on! I think the 29.8V supply must be surging over 30V when switching on, getting perfect 29.8V but no regulated adjustment so may have to try an alternative setup with a 2N2222 on the adjust and a relay switch on the feed in, I have also read that D3 should be replaced with a IN4148 and D4 replaced with IN4001 when higher voltages are pressent? oh well back to the drawing board. I will give it a try thanks Charl. After rectifier bridge and filter capacitors , I get 32V DC . The LM317 works fine, but as Charl said, maybe you’re using some LM317 variant that can’t handle this much. Possible, let me know if the tip35C works better. I got my tip3055 from ebay, seller thaishopetc (he sells good quality components). I have a hacked computer SMPS that gives out 12V@25A and 5V@40A. 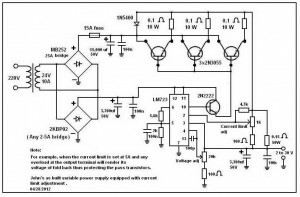 I was just thinking that can your circuit be used to get variable voltage upto 12V@25A? If yes then please suggest any modifications to the above circuit that can work for my setup. 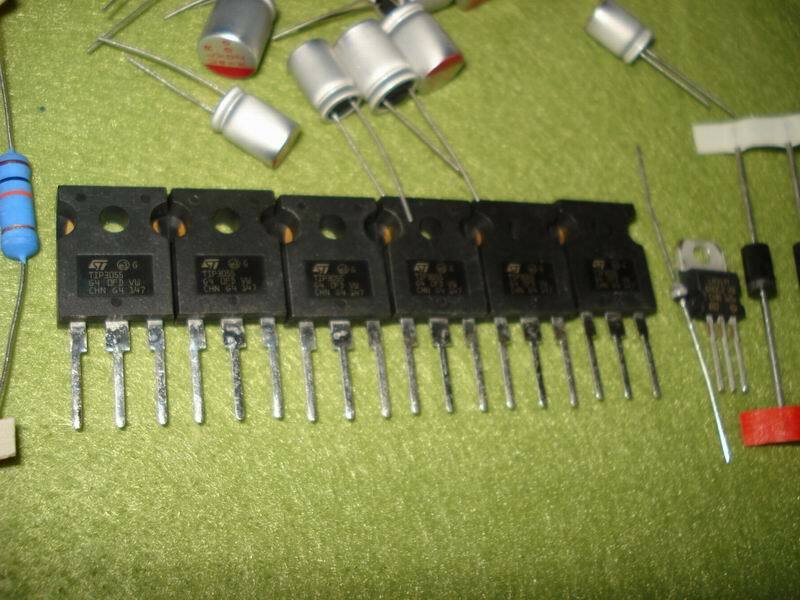 And one more query,the fast diodes used in your circuit are not available at my location,only one fast diode called BA157 and other common diodes like 1N4005,1N4148 and 1N5408 are available.Which one of them will work for D2,D3 and D4. 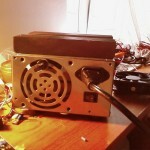 I will be using this to power my ZVS driver and plasma speaker. Will there be a need for 22000uf/50v cap. for my setup i.e for SMPS based supply,I mean that cap is being used for filtering(right? 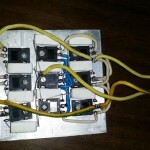 )while using transformer based supply.And if my setup do need it,will 4x 4700uf/35v cap bank work? And why C5 and C8 rated for 1KV.Are they there to absorb high voltage spikes from high voltage circuits you use(I will also be using this supply for the same applications). How many transistors(TIP3055)will be needed for my setup? Any other suggestions to protect my SMPS from back spikes generated while using zvs drivers and other high voltage drivers(I have already blown up my 2 SMPS(hacked ones),dont want to blow up this one). Abhishek, the diodes are not critical, feel free to replace them with what you find, just try to match the parameters as close as possible. You won’t be needing the filtering cap,since you are using the SMPS supply. 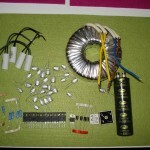 The high voltage caps are filters/spike absorbers, you should use them. If I remember correctly,one TIP3055 can dissipate 90W so to regulate the output from 0 to 12V@25A max, you’ll need 4 transistors and proper heatsink. To reduce the thermal stress / transistor you can use 6 like I did. Looking forward to your complete setup, send me some pictures when it’s done. I am on my way to make it as soon as possible(fight going on with my semester exams :)). Will surely send you some pics of my setup. One of my friend suggested that there should be a resistor in series with each collector of the transistor,otherwise they would blow up. 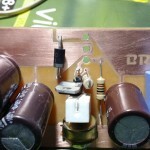 Indeed it is advisable to add resistors , not on the collectors but on the emitters (0.4- 1Ohm). For me it worked fine even without those. one question,what does the VA rating of a transformer indicates? Is VA equals the raw power available by the relation i.e Power=Voltage(V) x Current(I).In short,Is the VA rating of a transformer same as Voltage of the transformer multiplied by its current. I indicated the dissipation for worse case scenario: Vout = 0 . 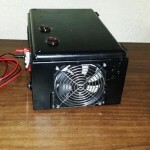 Completed my variable power supply,Thanks for the useful info you provided. Sending you pics of my supply in a minute. that’s great Abhishek, looking forward to seeing it! Is this supply short cicuit protected? Let me know about that mate. D1 si D6 cel mode sunt? sau ce parametri au? The transistors need emitter resistors to force current sharing (0,1-0,22 ohms each). Otherwise, the transistor with the highest beta (and lowest b-e voltage) will do all the work, become hotter, and fail. Secondly, you can considerably improve the regulation if you put the one end of the 220R resistor not to the LM output but to the emitters of the transistors (after the emitter resistors that is). 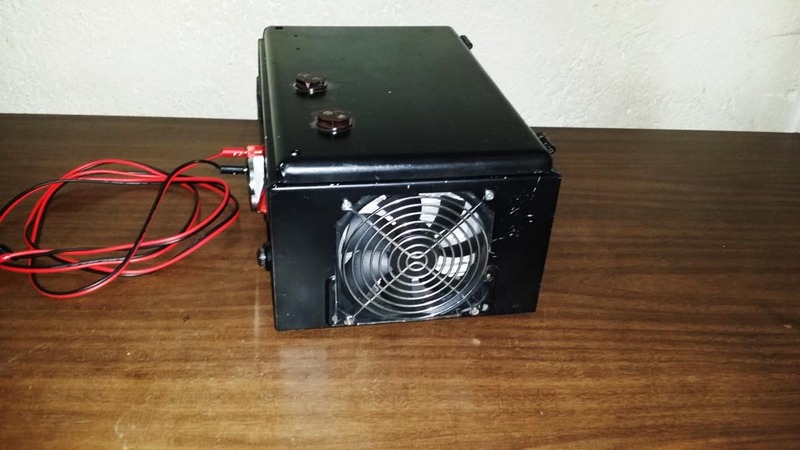 i build /rebuild competition car audio amplifiers some put out will over 10,000 watts continuous and run anywhere from 12 to 20 V I have six 16,000 watt amps in my setup. Thanks to all for all of your information. I believe it would work. You will need a big heatsink for the transistors, and see Martin’s and Joe’s suggestions above. I also fired up my transformer last night and get 32v dc at the 63000uf 50v cap. 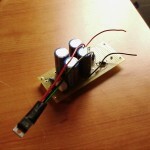 how to make one transistor drive the others. G’day mate, nice design and very well written article you’ve got here. I’ve got just one question with regard to the number of 3055’s. 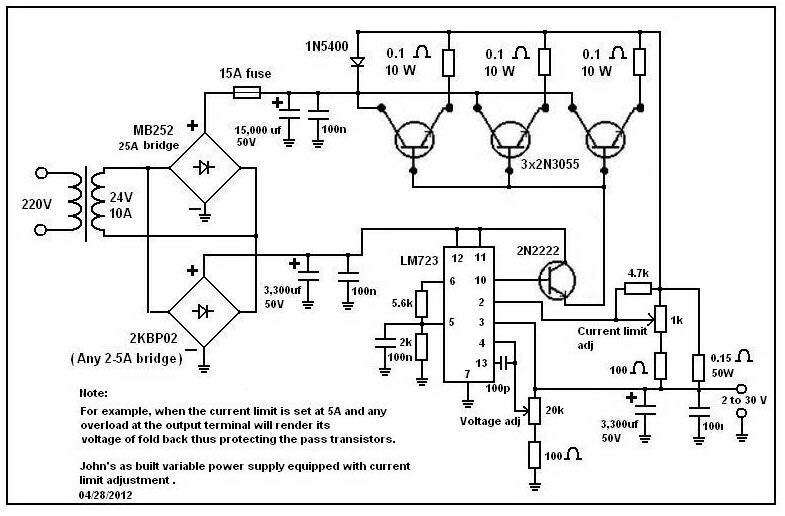 I plan to use this circuit on a 20.5 + 20.5 dual secondary XFMR that’s good for 30 amps per secondary and my question is, do you need to change the value of the base drive resistor (between the 317 and the base’s) depending on how many transistors are needed? Jim, I’m not aware of any such change. Initially I used this circuit with only 4 transistors and moved to 6 without any change on the resistor you’ve mentioned. sweet, thanks for the prompt reply. If all goes well, I’ll post the results in a couple of months. Where did you get this heat sink? It looks dirt&cheap, exactly the kind I want for my projets. what is its input voltage? Can this be connected to a 220V-outlet? No. This is for low voltage only. @TechMasterJoe, I wouldn’t encourage him to go for 220V. If he asked this question, it is almost certain he would plug the circuit directly to mains voltage, without doing the proper modifications. Is that a 3.3MOhm 5W resistor? Is there a higher resolution schematic available? Is there a complete parts list available other than the schematic? I’ve re-uploaded the higher res version, just click on the schematic to get the new file. If needed do a page refresh. 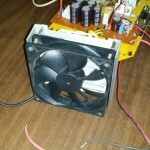 i want to use this power supply for 1A vareing from 3v to 12v for use of 1w led in parrell&seriel.whether power transistors are neccessery aslm317 can use up to 5A .wether the can be used as a current limitting one as led requires constant power supply constant voltage.here voltage is regulated .for current regulation i have to do? hi! 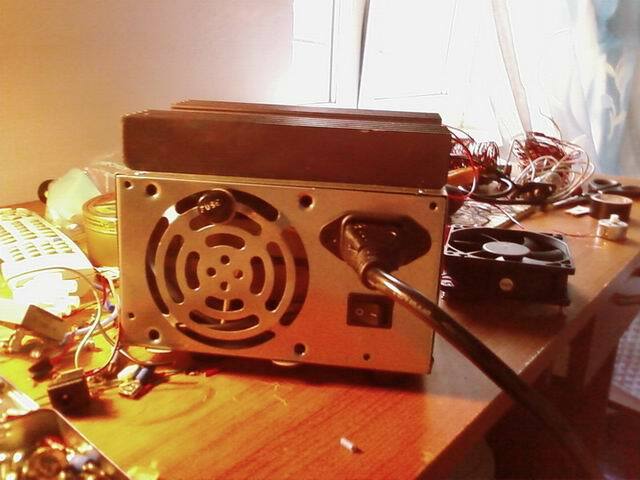 i made this power supply but i have a problem. when i put a any resistor the first tip3055 is getting to hot and then it burned.why this happen? any advise? its really a very nice project. can you please explain the operation of the Transistors here? and why 2n3055 blown off frequently? also explain the use of neon bulb a bit more? secondly can i connect 4 LM338 parallel to get 20A at output. 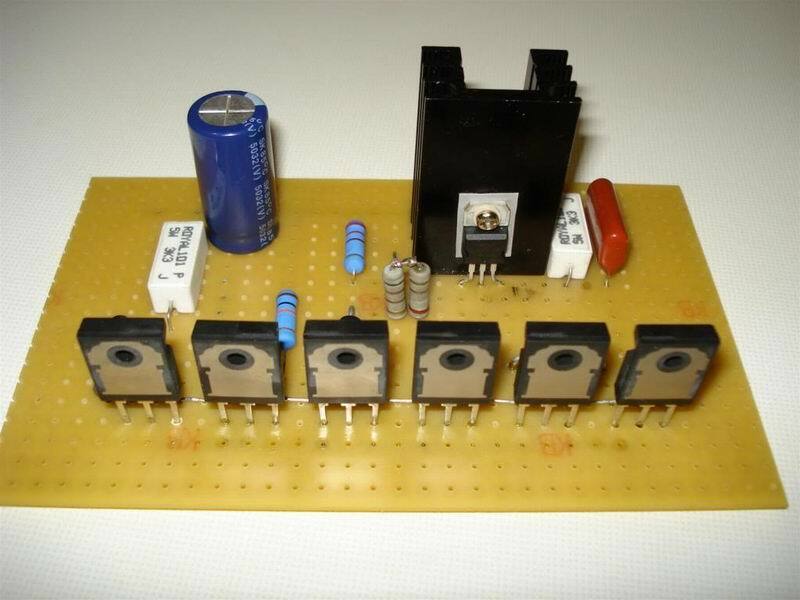 I am planning to build this power supply soon, as it seems to be a great design achieving both simplicity and high output power. I want to take into consideration Martin’s advice of adding emitter resistors of 0.1-0.2 ohms to force current sharing, and connecting the 220R resistor to the emitters. How many watts should the emitter resistors be? And the other end of the 220R resistor should be connected just before the fuse so as to be connected to all the emitters as well, then? Oh and if I understood correctly, TIP35C can be used instead of TIP3055 without any changes in the circuit? Thank you all very much, this is a very smart thread. I want to take into consideration Martin’s advice of adding emitter resistors of 0.1-0.2 ohms to force current sharing, and connecting the 220R resistor to the emitters. How many watts should the emitter resistors be? 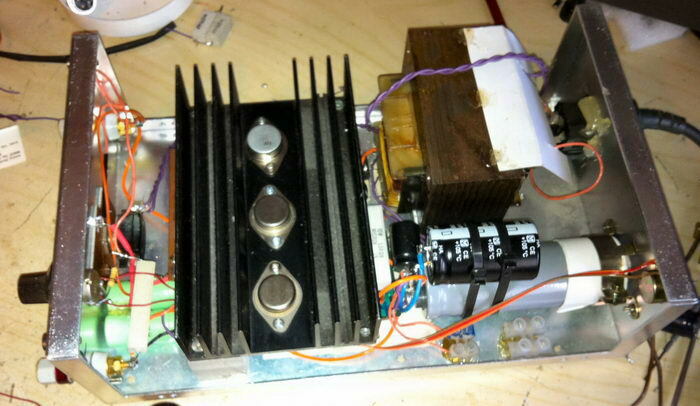 So, you will need at least 2.5Watts resistor, but it will get hot, so better to use like 3-5 Watts.. I also think that this construction is much better than the one shown above. 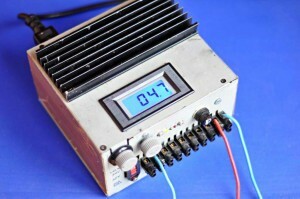 For instance it have all the transistors outputs grounded, this is especially good if you use transistors in TO3 case, because it completelly dismiss the use of insulators between the transistors TO3 case and heatskink thus greatly improves(lowers) thermal resistance(between the transistor case and heatskink). Yes. You can use whatever you like, but keep in mind, that you must still pay attention to the things like hfe gain, thermal junction-case resistance, power dissipation, etc..
yes it needs to be on your output right after all the transistors current sharing resistors..
add about 1000mcf+ for each amp you plain to drive on your output this is to filter the switching noise out it will slow voltage change a bit when little to no load is on. I used 5 x 5w 0.1 Ohm resistors on the emitters of the 5 x TIP3055 on my first build which ended up with 6 TIP3055 with the first one feeding the other 5 in a BE follower style which managed 28v 27A and after a while I did burn up one resitor, the six transisors are on two separate heatsinks with not a lot of room behind for the large resistors to get air to cool, when I rebuilt I noticed that on the old Zetagi psu TIP3055 back circuit boards (which was the base and case for my psu build)that the emitters from the old power transistors were linked with coiled stiff wire bridges and I decided to put the meter over one of them low and behold 0.1 Ohm! these were black and had seen lots of heat but still bang on so after lots of trawling through the junk box I managed to find some similar wire (paper clips) that when wound to the same design (3 turns around a 4mm drill bit) I got exactly 0.1 Ohm, these have been working fine now for about 12 weeks on a heavy duty cycle with the 6 TIP3055 layed out as per Radu’s diagram NOT a BE follower as my previous build. Keep building folks but please be safe. NPN power transistors? 220 Ohm resistor and 5k potentiometer smoked in my circuit, what can be the problem? 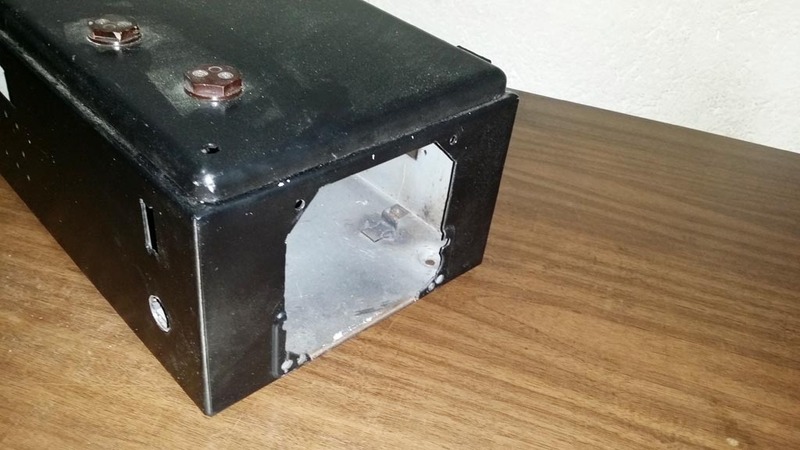 I have a question what modifications must be made in order to use a 60 volts/10 amps transformer insetead this transformer and extend the supply to 0-60 v? Hi brother. I have made your power supply but i am having some problems in it. 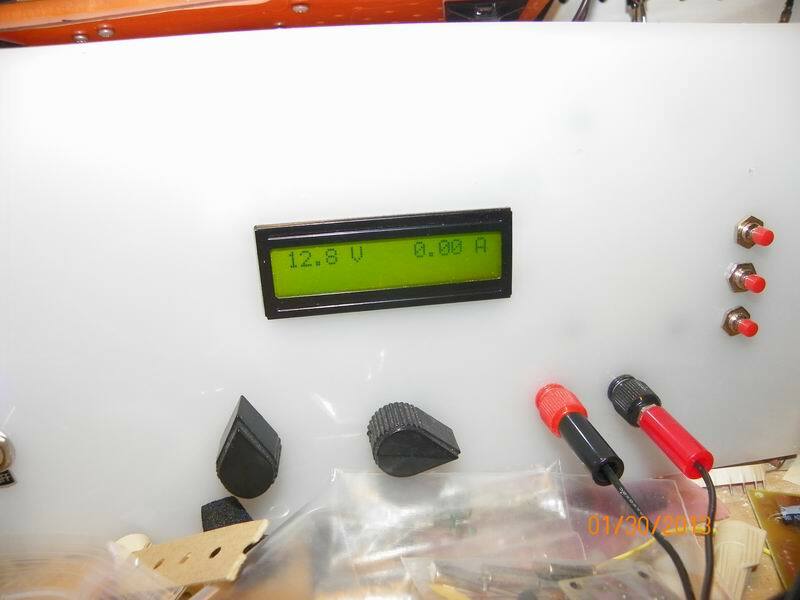 Voltage is shown on output something around 23.2 and it is not regulating. 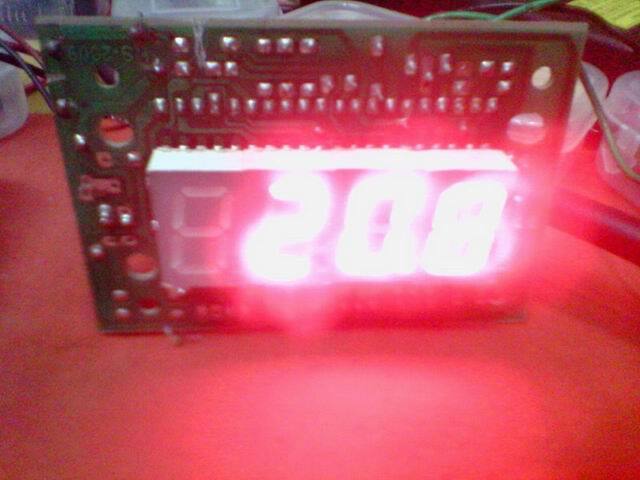 2 hours before it was fine but then my 220 resistor burned up and now voltage is not regulating with the pot. 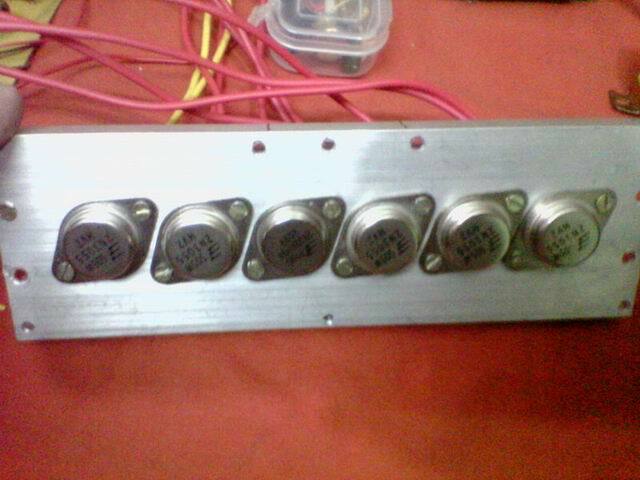 i have changed LM317 and the pot but all in vain. Can you plz help me. and i want to ask you that my transformer is of 36V and 325VA. So how much current will it give??? no correct answer specifically for my question.my i request for the correct answer please? Second, all the capacitors must be rated at +60V. If you look at sychematic, capacitors C3, C7, this two must be rated at 60V, probably its better to stick to 100V so you have a margin.. Please look at this helpfull site: http://ludens.cl/Electron/Thermal.html to determine, how many transistor you must use in your case. afaik, no other components have to be changed. For last have also a look, at the regulator datasheet, to determine its gain/resistance cue..
Radu, Thanks for sharing this design. As others have remarked, it is the best I’ve seen on the Internet. It’s particularly appealing to me after reading that you previously had trouble with high voltage spikes. I’m looking to build a new unit because I ruined the last with high voltage spikes. One question that I’d like to ask you is why you chose to use a toroidal transformer, instead of something more common that would have been inexpensive or maybe free? I only used a toroidal because that’s what a company I had access to was producing at that time. Feel free to use any other transformer of your choice. 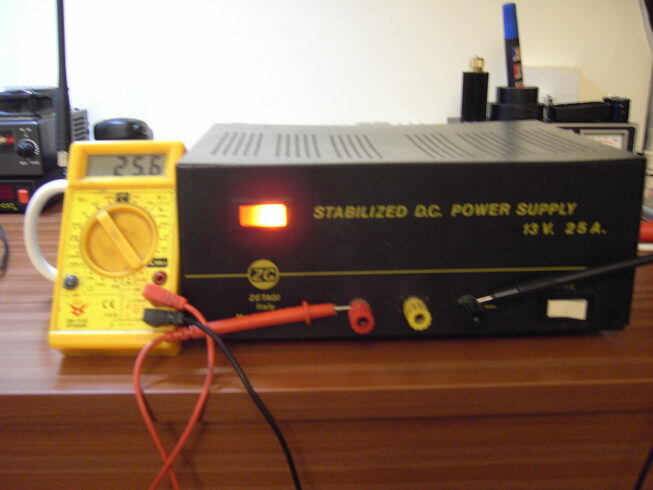 Please note to make this PSU you must first of all have a tranformer primary rated for your domestic votage supply that will also give you enough volts and amps secondary output for the DC supply you require, for example here I use a 240v primary AC volts input with an output of just under 30V before any smoothing or rectificaton to DC, it is a very large old heavy core transformer and gives as stable smooth DC output of 0-26V and 25A once rectified so dont expect small discarded (junk) transformers to perform miracles. 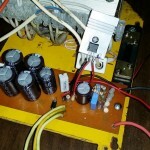 Also if you have problems with the voltage regulator side of the psu when experimenting with old transformers I have found that a company on ebay are selling good quality pre assembled ajustable voltage regulator boards for various volts/amps at a very cheap price, you do need to remove the onboard preset variable resistor and add a wired potentiometer of the same value to it for ease of use but it makes testing far quicker and easier. 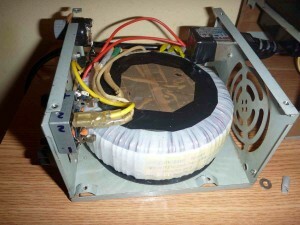 Remember there are many versions of this simple psu and as Radu has done you might have to change some things to meet your specific requirements like short circuit protection, extra smoothing, filtering, surge and spike protection, common ground noise offset, this is just the basic useable variable regulated psu. 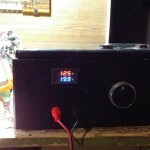 If it is your first build try starting small under 9v with a nicad charger for example and later when you get the idea of how things work you could be building something like my latest PSU 240v in 1200v out with soft start switching feeding 3 old TV sweep tubes(vales) now that can kill you. Have fun but please stay safe. 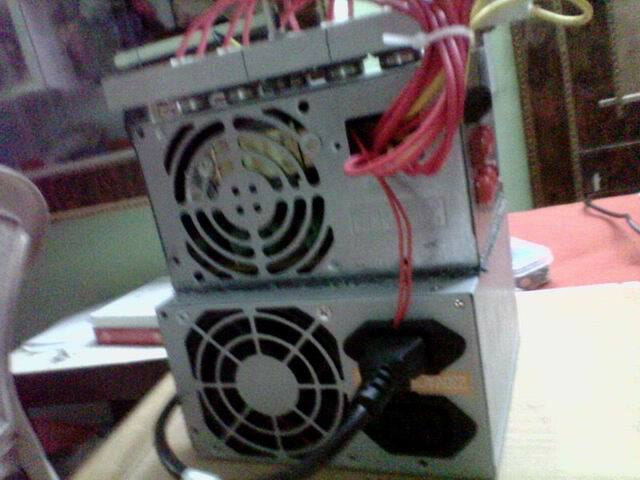 I have constructed the power supply, every thing works fine. However I noticed that at high load (5A)or more there is a voltage drop of slightly over a volt. Somehow the LM317 does not seem to take care of this voltage drop. Is this normal. Many thanks. Which version of it have you built? Chances are, if you’re using load sharing resistors on the emitters, and have implemented the feedback to the 317 before the final output stage, the drop is across those resistors and transistors. Where have you connected your voltage meter? 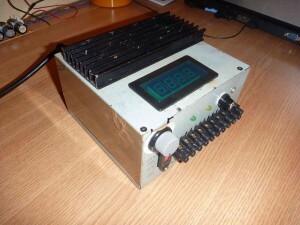 I have built the version designed by Radu Motisan dated 21st 2010. I have three 2N3055 in parallel each with a load sharing resistor of 0.1 ohm. 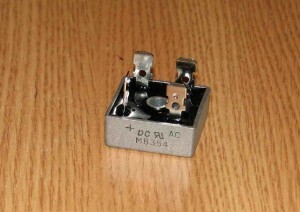 The adjust terminal of the 317 is connected to the base of the transistors through a 220 ohm resistor. Other than this, there is no feedback from the final output stage to the 317. 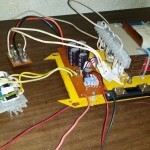 To measure the output voltage, I connected the voltmeter across the output of the final stage and ground. 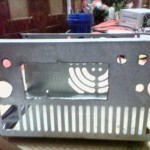 Under load, there will be voltage drop across the transistors and the load sharing resistors, but the 317’s job is to regulate and maintain constant set voltage. Am I right to assume this? Thanks. The 317’s feedback to the ADJ pin as you’ve mentioned, is coming from the regulator’s output voltage at the base’s. You’re also correct that there will be a voltage drop of “x” across the transistors and load sharing resistors, that drop however is dependent on the load current and is outside of the “feedback loop”. I’m stabbin in the dark here as I’ve not yet built this PSU but I’d wager if you were to take a voltage measurement at the 317 regulator’s output (and probably at the final output at the same time to prove the point) and then loaded the power supply down, You’d find that the voltage at the 317’s output remains constant, while the final output suffers from the drop. I’d have to build one and muck around with it a bit to figure out how to go about overcoming that. I always thought that what you are describing would be the case with this design. The only way (if I’m right in my assumptions) to stop it from happening, would be to somehow reconfigure the “feedback loop” such that it got it’s reference from the final output of the transistors instead of the base’s. I could be miles off tho, again, I haven’t had the chance to build and test one of these yet. Maybe someone else could throw in with some more info. I did the voltage measurements as you have suggested. Indeed the voltage at the output of the 317 remains constant while the final output stage suffers the drop. This voltage drop includes that of the bridage retifier circuit. Since the 220 Ohm sensing resistor is connected to the output of the 317, and this voltage is constant hence no regulation takes place. If the 220 Ohm resistor is terminated at the 0.1 ohm resistor, this might activate the regulation function of the 317. What do you think? Yeah mate, that’d be what I’d try, but having not seen a 317 datasheet in over 10 years I can’t guarantee that it will work either as expected OR without frying anything. If you’re game enough to try it tho, make sure you leave D3 in parallel with the 220 resistor and terminate it AFTER the load sharing resistors (IE: terminate at the final output rail). If you do try it, I’d be very interested to know how it went. … I can’t see why it wouldn’t work. Thanks for the link. I did try terminating the 220 Ohm (with a diode in parallel) at the final output line. I measured the line voltage. At light load, the voltage is constant, however at heavy load (>5A) the voltage drop is apperant. I also measured the voltage across the bridage retifier, and there was a voltage drop. I did try one other thing, that is having a separate bridage retifier and filter circuit just for the input to the 317. At heavy load there was no drop across this cicuit and the voltage at the final stage at a contant. This seems to have solved the problem. However, I would think the LM723 is a better regulator chip as one can set the current limit to protect the bypass transistors. 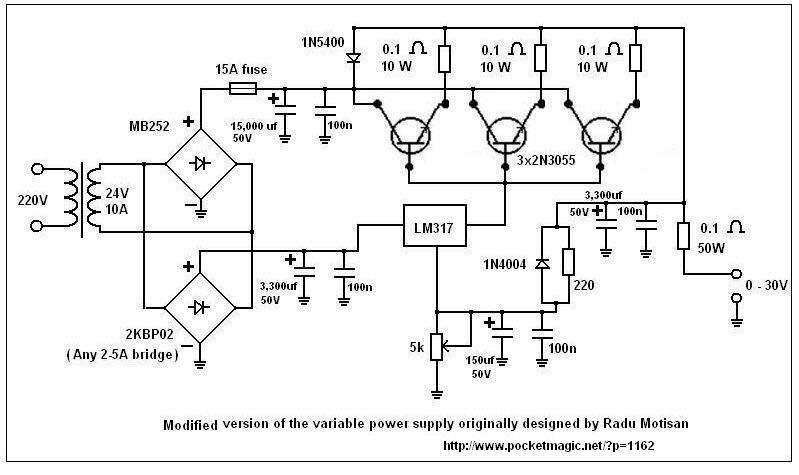 Any chance you could post a schematic of the solution? 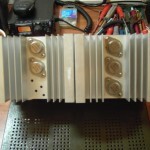 How big was/is the original rectifier? Is it heating up? Either way, glad to hear you’ve got it solved. I’ll keep it in mind when I build mine. Currently I’m trying to find out if it would be cheaper to replace the final drive transistors with an IGBT especially as the psu I’m planning on building is capable of 120amps constant and I’m worried about pulse current capabilities. 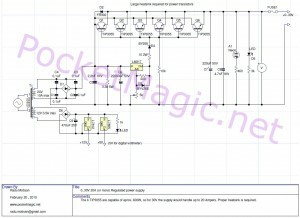 I have the schematics for PSU with the LM317 and LM723. I finally built the the one with LM723 as it has a adjustable current limit. 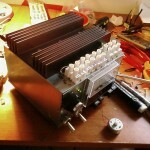 The bridge rectifier is a 25A one and is mounted on the metal chassis. It runs cool at 10A. Though I have the two schmetics drawn, but do not know how to post them here. 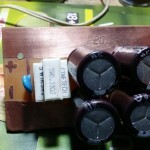 You are right that the common transistors would be hard pressed for providing 120A. IGBT would be a better bet I think. 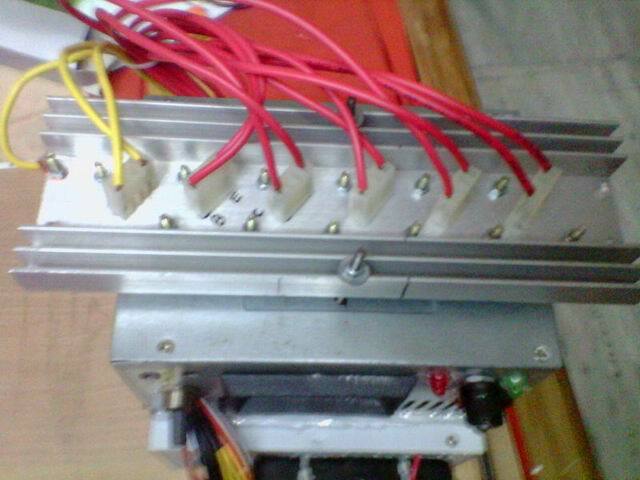 Have not done any project with IGBT yet. 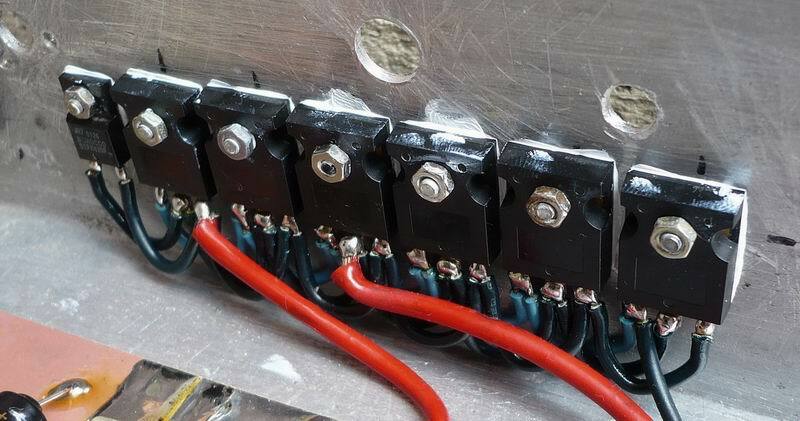 My opinion is that for high current PSU a switching mode construction would be better as it operates at higher frequency and thus need fewer windings of very heavy guage wire for the transformer. I don’t think IGBT would work with this design. 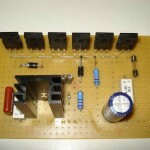 A linear/bipolar power transistor is required. 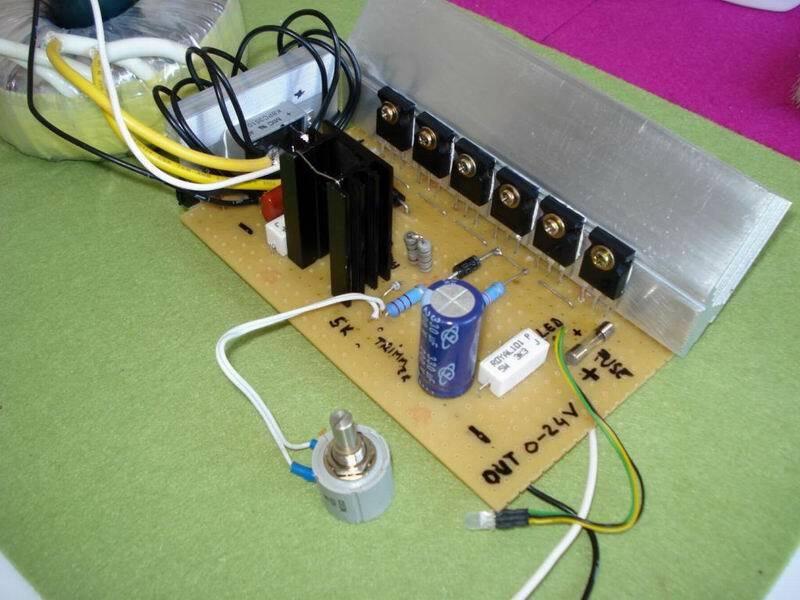 For IGBT or Mosfets a completely different design must be considered (switching supply). All good buddy in respect to posting schematics. I will have a look at the 723 chips though, thanks for the tip. 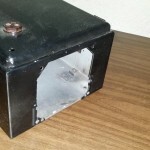 Also I agree that an SMPS design would be a better option, but money is the issue and the massive lump of steel xfmr is sitting here begging to be used, if nothing else, it would make for a very good lead acid charger. Do you have any suggestions as to where I might find an SMPS circuit to regulate low voltage (from 32v down)? SMPS design is a bit out of my league atm. 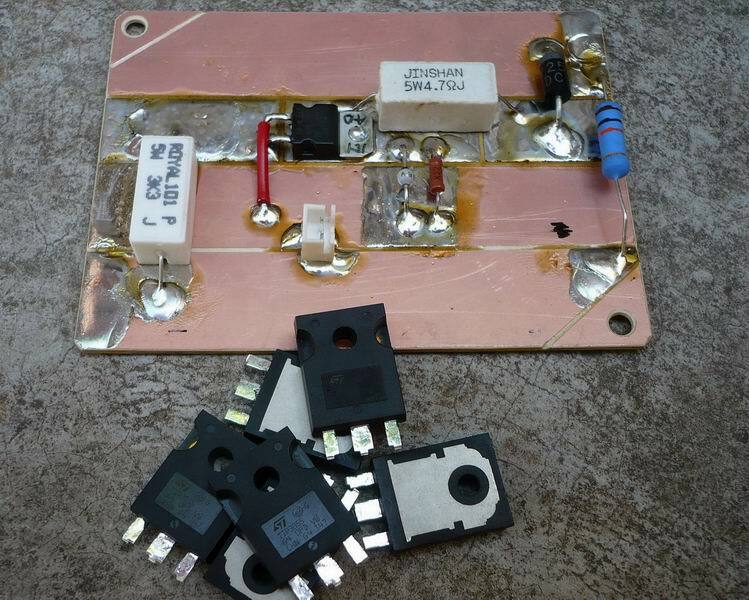 I do have a contact on IRC who is an EE and has built a linear reg from an IGBT and tells me that it is possible to configure them as an emitter follower. IGBT’s also are new to me but from the 6 odd hours of reading I did last night on them, I too am not seeing how you could configure them that way, or how to “control” the gate in linear mode. 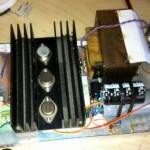 Currently I’m working on a plasma speaker that’s MOSFET driven and it’s a bit of a learning curve. @John, your two schematics have been added to the article. If you want , send me a few pics of the final assembly, I can include those as well. This invitation is valid for others that built this supply, too. @Jimmy, I totally agree about using your big transformer. I don’t think you’ll be able to control the gate linearly so IGBTs might not be an option with the LM317/723s. THANK YOU very very, VERY much. I’ve been searching for several years for circuits of that nature, to no avail. A lot of very good info on that page. Thanks again! @Jimmy, np, glad it helped. @John, pics have been added. @Phil, thanks for the pictures! Can i use this circuit to a 125amp 12-0-12 transformer? if yes what will be the modification will i do. 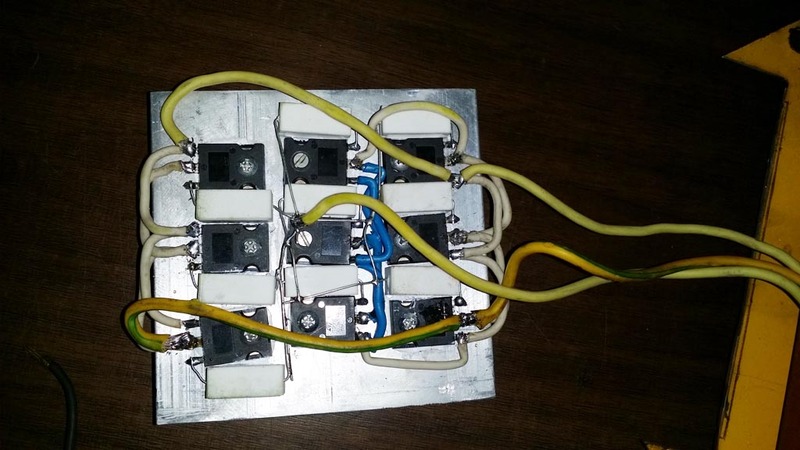 is this manageable to a 1500watts transformer? @MikeL you can feed the 12 / 12 directly in the rectifier and skip the 0 tap. for 1500W it will probably work, using enough transistors, but I don’t think any of us here had a chance to test it up to this level. so let us know how it goes if you give it a go. Well Radu Murphys law has struck here and its back to the drawing board for me, I was testing my newly built RF switching board onto the Mill spec RF amplifier set for about half of its 300w max output into my high power oil filled dummy load and all was well for the first hour under inspection so I popped out to check on my boat (pre summer sailing checks) when I got back one relay had failed and held in the closed TX position! for how long I dont know? but the psu had also failed under the constant load. 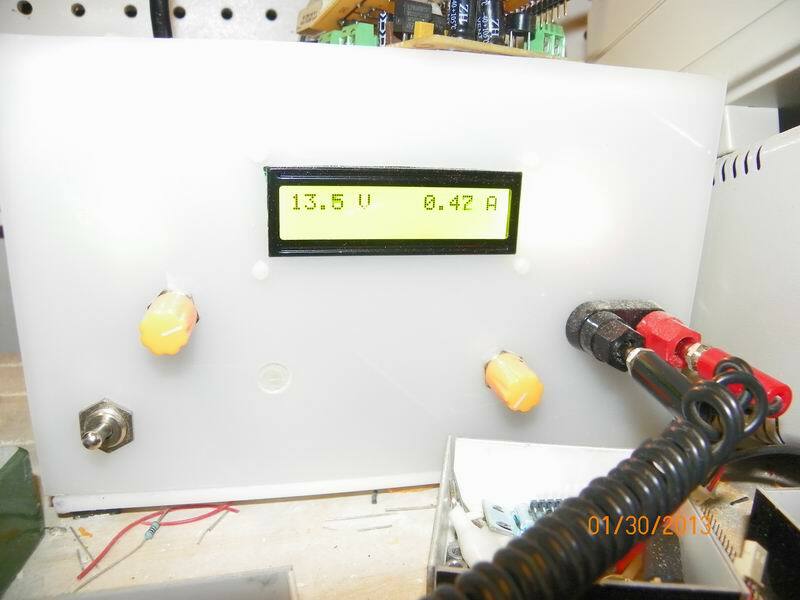 It is now only variable from 11.4v to max output istead of 0v to max. but the current is also down (possible two failures here)so it will be stripped down and each block checked independantly, another good reason for the V reg board being independant, I will bet my pants on the first power transistor in the BE follower going short circuit and a diode on the V reg board, I may try Johns idea of a second BR with current regulation before I walk away from this project again! 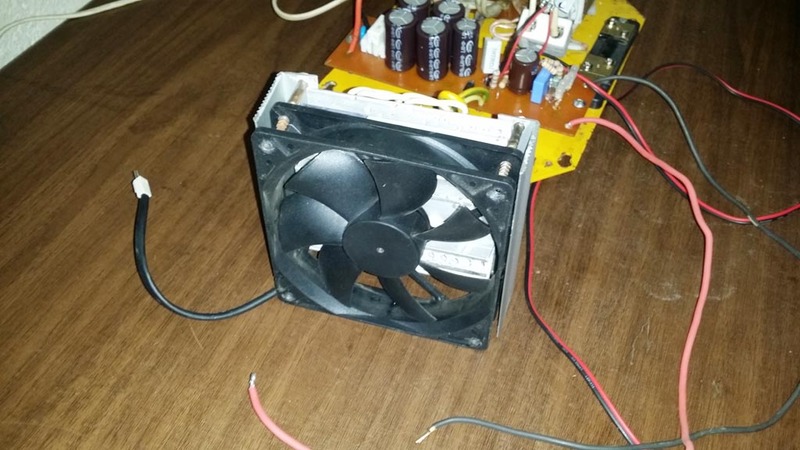 Sorry to hear of your problem with your power supply. 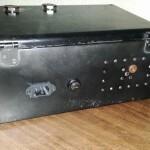 I came across this link, http://www.spaennare.se/psupply.html just a day ago and could provide some answers to solving your PSU problem. Good luck. Thanks for this nice design, I’ve found this thread very interesting. As an exercise to learn Eagle, I designed a PCB based off of John’s LM723 schematic with some tweaks. This is my _first_ attempt at a PCB design, so it will almost certainly have some problems, so be wary of attempting to use it as is. I’m not sure when I’ll be able to actually try to build it. I’d be interested in any feedback. * Added T1Alt which could be a different transistor to replace the 2N2222 (T1) in case you wanted to try out a different transistor (ina TO-220 package) to drive the pass transistors. You would not use T1 and T1Alt at the same time. 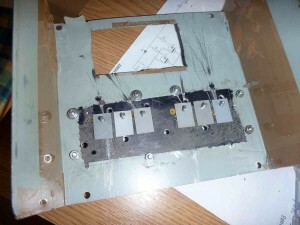 * There are three mounting holes on the board which could be used to mount an 80mm cooling fan with some standoffs. I couldn’t find space for the 4th hole. 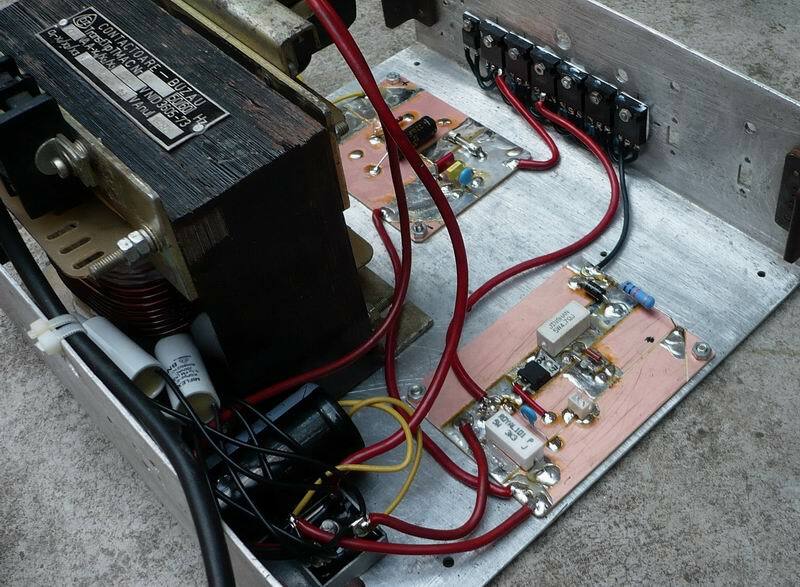 The main bridge rectifier, power transistors and current sharing resistors are intended to mounted off the board, on a large heat sink. The board has provisions for connecting those components. Did you build it already? If yes it would be great if you would post a few pictures with your results. 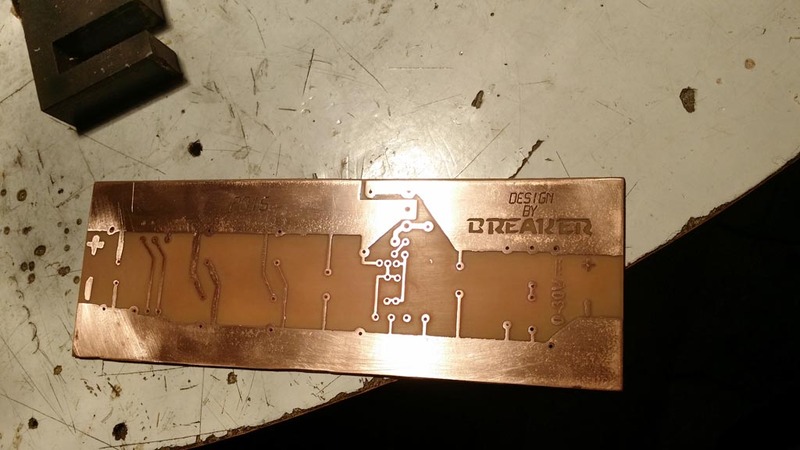 Also it might be a good idea to create a PCB layout for single sided boards – for most of the readers, they are easier to make as DIY . I believe given the relatively simple design of the circuit, it is possible with no complications. I haven’t built it yet, but I will keep you posted when I do. Thanks for that link John, some great reading there and it answers a few questions! the problem was overheating on the feed transistor of the BE follower setup due to the heavy (constant) current draw, another remedy I have found is a few diodes in a series chain to the base of the first transitor from the output of the LM317 (this is an old valve current biasing trick) this does stabalise the psu but restricted the total current limits somewhat under what I require, strangely after reading the link you gave It looks like the same setup as a comercial 22-25A variable voltage psu I have resurected which died due to overheating (it had a realy small internal fan) I repaired it and mounted a very large 12v-16v PC case fan on the top conected to the thermostactic regulated fan switch and it now works a treat all day long on hot days under full load so I think I will go down the route of over current protection and forced cooling for the homebrew psu. 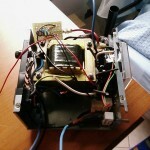 Also I have decided to remove the feed transistor from the common large heatsinks with the other five power transistors and give it its own personal fan cooled heatsink similar to the BR which will have the extra benefit of allowing a sixth power transistor which should ease the load a little. Hi Phil, great to hear that you have finally got the problem solved and that the unit is running full load without problem. I think over current protection with instantaneous tripping is a good thing to have when dealing with large output power. Anything that saves me having to strip it down again and removing the transistors from the heatsinks “again!” has got to be good thing, fingers crossed. One thing I must say is that the little pre built regulator boards from AudioWind on ebay (3A version only £6.00) are indistructable, Ive ran it past its current limit for short periods, shown it a short circuit and ran it realy hot for a long time and it still keeps ticking, I am going to get one of their 5A versions and see how much punishment that can take soon. Please see the comments above, for a current controlled version. I’ve also added the schematics to the main article, at the bottom. 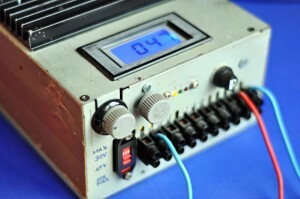 Is it possible to build two variable positive power supplies like the 0- 30v/20 amp supply and hook them up together to give +/- supply ,if it is how is it be done ? Heyy,back here after quite a time. My SMPS based supply still working well(touch wood),Thanks for your support Radu Motisan. 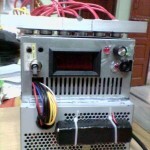 Recently i got a 850VA inverter’s transformer.I want to know that will the same circuit work with this transformer as well? P.S The transformer is 12V rated? Also can you please provide a circuit for short circuit protection? Ho letto con attenzione la tua pubblicazione relativa all’alimentatore davvero molto interessante, siccome possiedo un trasformatore 220/24 con potenza di 800 VA un 723 e altri componenti. Vorrei scegliere lo schema di John’s solo perchè ha la protezione contro il cortocircuito, ma volevo chiederti lo schema di John può fornire 20 ampere in uscita ? Posso utilizzare i 2n3055 ( anche se ho letto nel forum che qualcuno li ha bruciati ) al posto dei tip3055 o meglio che utilizzo quelli che tu mi hai consigliato. Si, puoi utilizzare i 2n3055. Using the 0.1 ohm 5 watt resistor in the emitor of the 2N3055 transistors is ok. This means that each transistor handles up to 7A giving a total of 21A (3X7A). 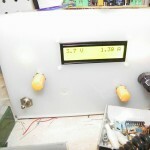 You can use the 10k pot instead of the 20k pot for the voltage adjustment circuit. As for the current limit circuit, either a 500 ohm pot or a 2k pot will work. Two 0.25 ohm resistor in parallel will give you 0.125 ohm which is close enough. hi John thank you for your reply very soon….its very helpful for me……. (1) First of all you have to have the software ie, the HEX file and secondly you have to programe it into the pic1684a. 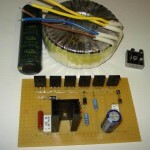 My suggestions to overcome your inductor and relay problems are as follows. 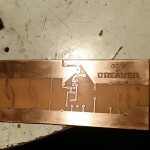 (2) You can connect your 5v relay to pin 18 of the pic through a pnp transistor. Connect the base (b) of the transistor to pin 18, one end of relay to the collector (c) and the other end to ground. Then wire a diode in parallel with the relay with the cathode on the collector side and the anode to the ground. The emitter of the transistor is wired to the +5v. 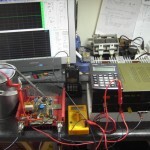 (3) One of the pictures in the link you provided shows a 80uh inducture being measured by the LC meter. It has 4 turns of wire. 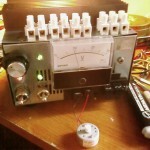 What you can do is to build the LC meter. 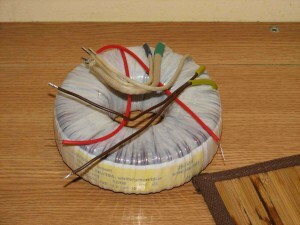 Then wind 5 turns of magnet wire (as shown) and connect it to the LC circuit. When all is correctly done power the LC meter up. 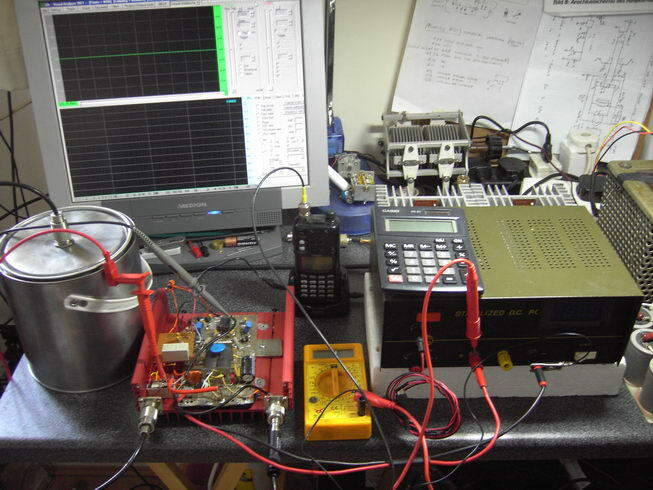 Now use a known inductor such as what you already have (ie 100uh) and check the reading. 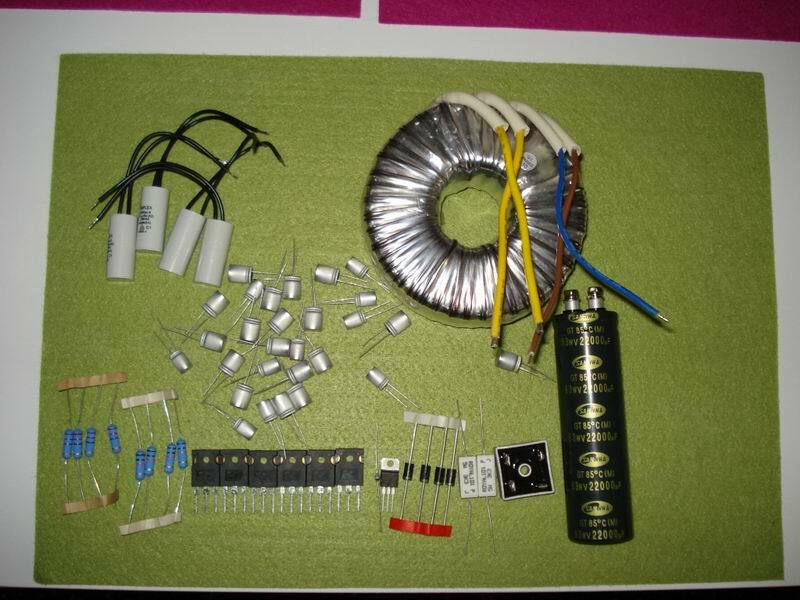 Adjust the number of turns of your homemade inductor so that such the reading is 100uh. I will do it this way myself if I donot have the 82uh inductor. witch pin should i use?? i have the hex file. if i use the 680uh and 100uh in parallel i will get 87.179uh may i use it????? The picture of the relay shows that Pins 2 and 6 is the winding. To confirm this put a 50 or 100 0hm resistor in series with the winding and connect it to a 5v supply. You should hear a click sound. Use a multimeter to test for continuity between pins 1,14 and 13 or between 7,8 and 9. 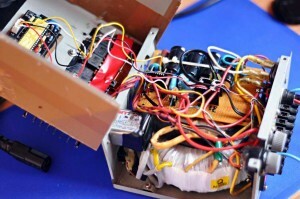 After you found the continuity, disconnect the winding from the supply and the circuit should open. This should be the contacts you use. As for the inductor in paraller this is fine except that the two inductors must not be wired close to each other so that there will not be any mutual inductance between them. Since you have the Hex file I take it you have no problem programming the pic. because https://picasaweb.google.com/lh/photo/3bWfcvvva–jIuXxLWfG6dMTjNZETYmyPJy0liipFm0?feat=directlink this what i got from the circuit…..
only calibrating more than from 5 min ..
will you see this for me? am i correct or not…..
because i have a little confutation on the marked pins https://picasaweb.google.com/lh/photo/gkfoLlqXfWGvgZxDxxkWxtMTjNZETYmyPJy0liipFm0?feat=directlink …. First of all, there is a mistake as you have connected the other side of the relay to 5v. It should be to ground instead!. Not sure what pnp transistor you are using, would be best to connect a 4.7k resistor in series with the base (b). Pins 3 and 17 of the pic should be connected together. Pin 4 is a reset pin and should be connected to 5v via a 1k or 5k resistor. Pin 14 is the supply point for the pic. Yes in the original circuit (without the pnp trnasistor)the relay is connected directly to 5v. 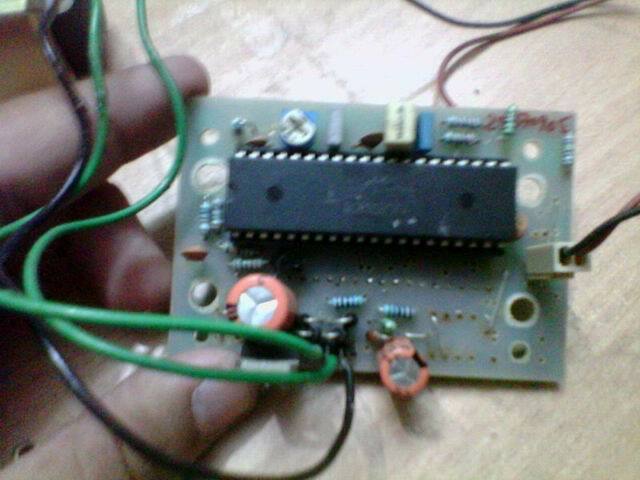 Now look at the modified circuit, particually at the PNP transistor part of the circuit carefully. The emitter of the transistor is connected to the 5v line and therefore the collector (with the relay in series) should be connected to the ground to form a closed circuit. To be safe connect a 4.7k resistor in series with the base (b) of the BC557. hi john is htis two relay is reed relay or regular relay???????? The two relays are not reed relays, they are regular relays. Any 5v relay with a set of normally open contacts will work. in the original circuit the pin 1,5,16 of pic connected together..pin 16 grounded..pin 4 and pin 5 connected with a push button . pin 14 and pin pin 4 connected with a 6.8k…then from pin 14 is connected with 5v..
and you told me pin 4 of the pic via a 1k or 5k resistor to the 5v line..
so ehich one should i do. 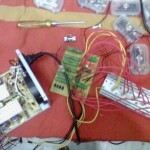 one more thing which relay should i use in software 5v reed relay or normal relay???? so which one should i do. which relay should i use in software 5v reed relay or normal relay???? one more thing is the hex file need modification’s for recent changes of the circuit ??? What I told you is the same regarding the pin14 and pin4 except the original circuit has a 6.8k instead of 1k to 5k. Notice that pin5 is grounded and pin4 is connected to one end of the push button and the other end of the push button is grounded. You can use whatever you have on hand, it does’nt matter. No changes are needed in the Hex file. Perhaps you should read the schematic and understand it better. 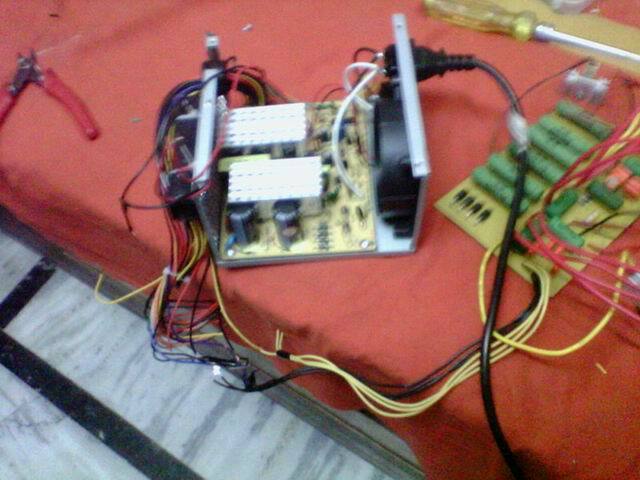 thank you for replying…..i am going build the circuit as you said…. one more thing i got two .25 ohms 50 watt not 100 watt…..is it work or i have to wait for another two to make it 50 watt ??????????? (2) As for the reed relays shown in the link, and under the application notes, they are not recommended for low level work where load current is in the range of uA or few mA. May not work reliably for the LC meter project. 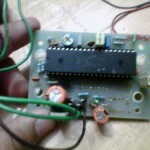 HI JOHN, can i use this relay http://www.datasheetdir.com/HFD27-024-S+download ???? Use HFD27-005-S. 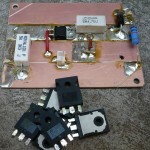 This relay is rated at 5v whereas HFD27-024-S is rated at 24v. 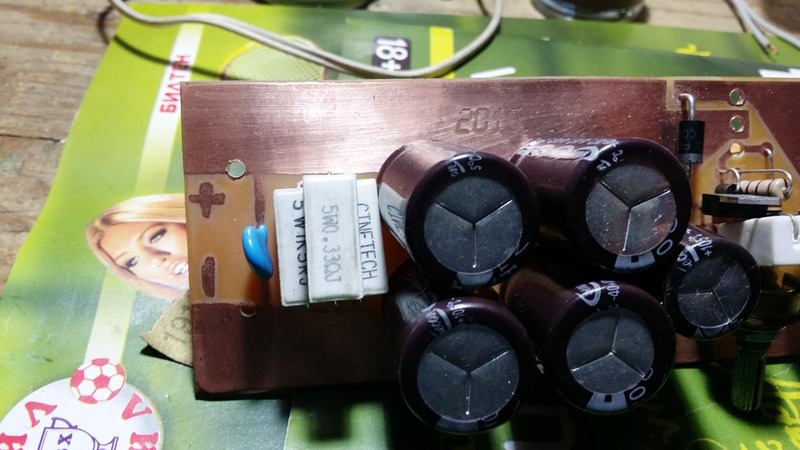 https://picasaweb.google.com/lh/photo/IyL2E6Fo2IeBNTy2rQ5SpNMTjNZETYmyPJy0liipFm0?feat=directlink this is the picture of HFD27-005-S relay… and i have it …now which pin should i connect in my circuit ????? is it necessary to add the 15A fuse in your circuit? 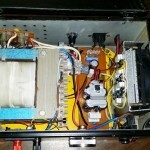 Google images for HFD27-005-S you will find the pinout for the relay. Pins 1 and 16 is the coil. either pins 13 and 11 or 9 is one set of normally open contact or 4 and 6 or 8 the other set of normally open contact. You can use either set. It is essential to have fuse protection in the primary and the seconday side. You can decide the rating yourself. 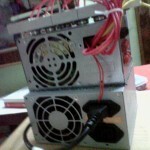 hi John how much watt heat sink i need for the power supply ?????????? i think it’s best to have a heat sink rated for 50% the wattage of the total power output. 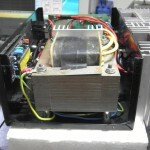 But in Big drops at full load as much as 75% of input can be lost as heat so big mosfets and big heat sinks are needed. 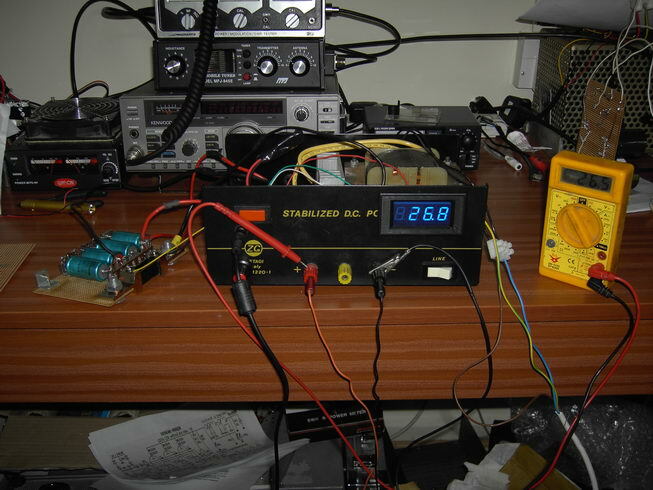 so 220V X4 filtered then pulsed 80~160khz ALL DC it can Kill in under 1us for sure..
it has a output range of 1.8V to 40V and Full Amprage zero loss i have added current limiting for testing LEDS and things so fare it works betting then i can hope. 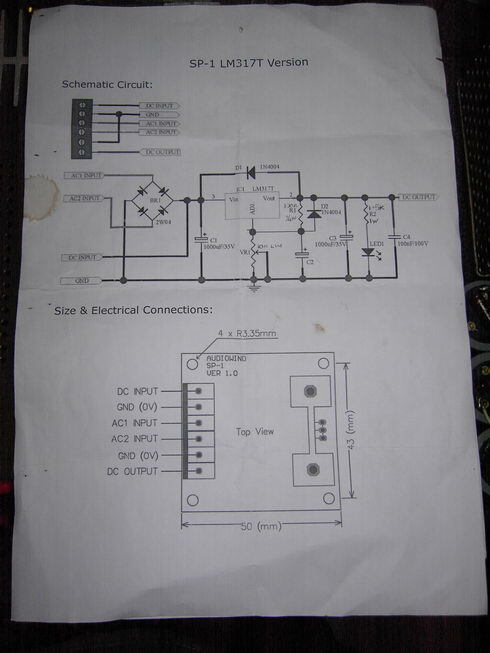 hi John can you see this once this is your circuit nad i made a printed pcb of it….is it correct or not ??? plz…. because i am not getting any response from it…may be i did some mistake..
may be you also need to see this https://picasaweb.google.com/lh/photo/4kzNY8z_2guzof3SYBHZsNMTjNZETYmyPJy0liipFm0?feat=directlink…. 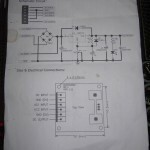 You should ckeck your re-drawn schematic. There is a mistake there!. The negative (-ve) points of C1 and C2 should be connected to the negarive (-ve) points of C3 and C4. 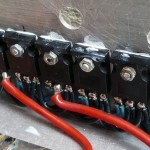 This the common ground connection between the two bridge rectifiers. This connection is also missing in your pcb. You need to check your final circuit carefully or else you will blow something! thank you for your reply..When you told me about the mistake i saw it and modify it as you told…. But still the same no response..May be again my mistake…But i think its same as yours…..
2. Diode……………as i don’t have 5400 i uses 5402…. will you plz see the picture…. After reading the comments by Borys and others, could inrush current be killing the LM317 and the TIP3055 transistors? I = C x V/t rough calculation for it. For calculating the filter cap for the supply C = I*t/ΔV 20*0.01/10 = 20000uf . 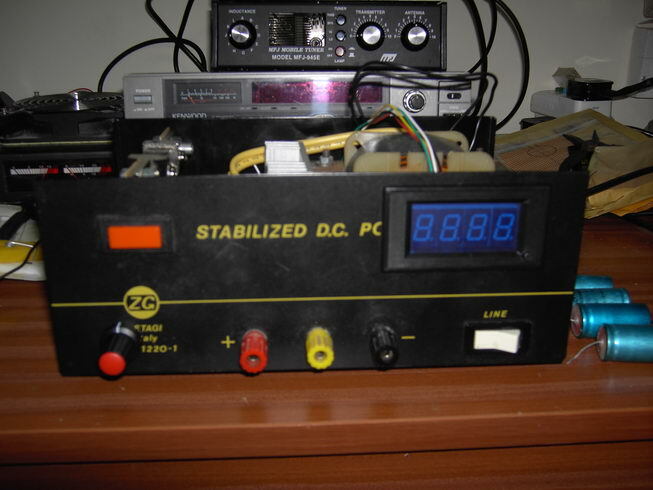 i intend to DIY a variable power supply at 0 to 30VDc at 50AmpDC. do anyone have a simple design at budget cost? 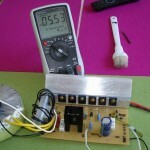 @EddyBearChew , you can use the LM317 simple design presented in the article, and simply add more transistors in parallel. I have both TIP3055 and TIP35 which is better ? 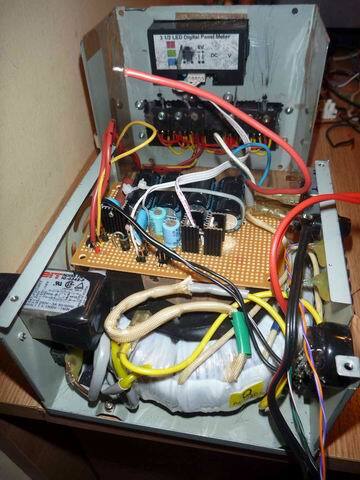 i have read the datasheet of TIP35 and i found its capable of handling 25A Collector current. so can i use 2 TIP35 Instead of using 3 TIP3055 ? You can do the change, but you’ll need to dissipate the same amount of heat – so make sure you have a big enough heat sink. Thanks Radu…but if i m not utilizing full capacity of it…so i think there wont be much heat…? right ? Because heat is directly related to Current Flowing…I2R ? right ? Yes kalpesh, that is correct. 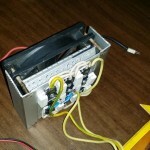 Actually i have 24-15AMP Power Supply i mean (SMPS) Can i use instead of this Transformer ? 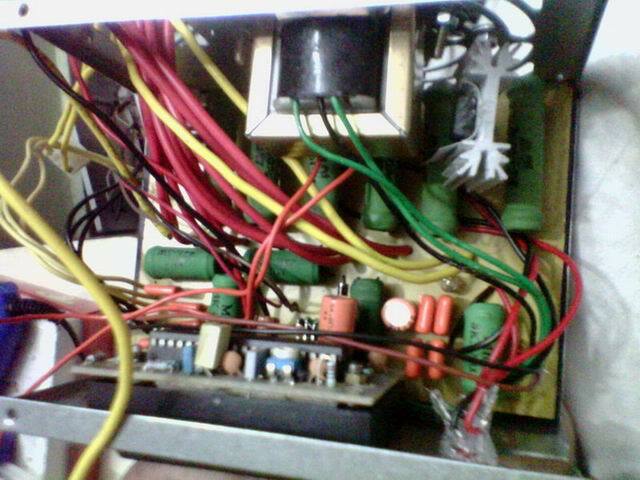 Because here m confused with Two Different Power Supply output i mean 2 parts of Transformer 30-0-30. I have 0-24 DC. Can i use with this circuit ? @John’s version using Lm723 IC. I see some people are using fancy Amp (current) Read out displays. Where on the circuit is a good place to tap into for good precise current readings of the current limiter? If I were to design a PCB I want to add a connector location for a display or something. Please be descriptive so that others can read this to finally know and answer the question once and for all. P.S The transformer is 12V rated. I want’t to build the one from John with the current control feature. What changes are requiered to get 15 amps out of it and what transformer should I use? Can I use TIP3055 instead of 2n3055? Another Question: What happens if I short the output? I am going with one of the designs above. If we use the regulator just driving the transistors with no feed back path all you will get is line regulation. 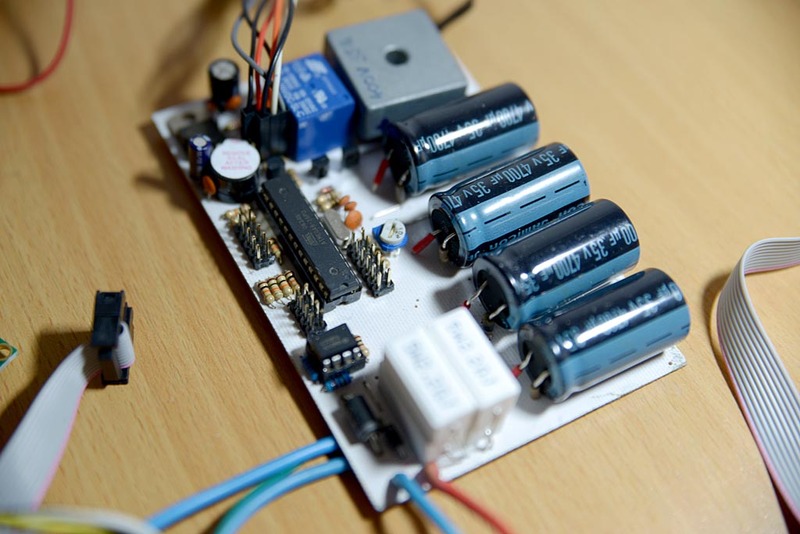 The regulators output will stay constant and it will drive the output transistors with this constant voltage, and although the output from the regulator will stay constant, it is not measuring the final output and it will not drive the output pass transistors any harder to compensate to changes due to variations in load. 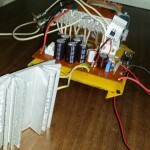 hi Radu, I am building a Variable power supply based on your specification and I have few questions hope you can answer them. 1. Whats the specification of D1 and D6 ? 2. 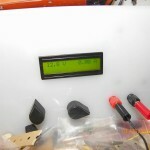 Can we add a digital meter for Current/Voltage ? 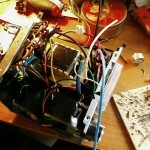 This is going to be my first electronic project, so please bear with me if the questions are silly. Where can I get the transformer you listed? I built John’s version of this supply, and it works quite well. 1. I used a 27 VAC transformer. A 24 volt transformer is ideal, but I had the 27 volt lying around and used that instead. 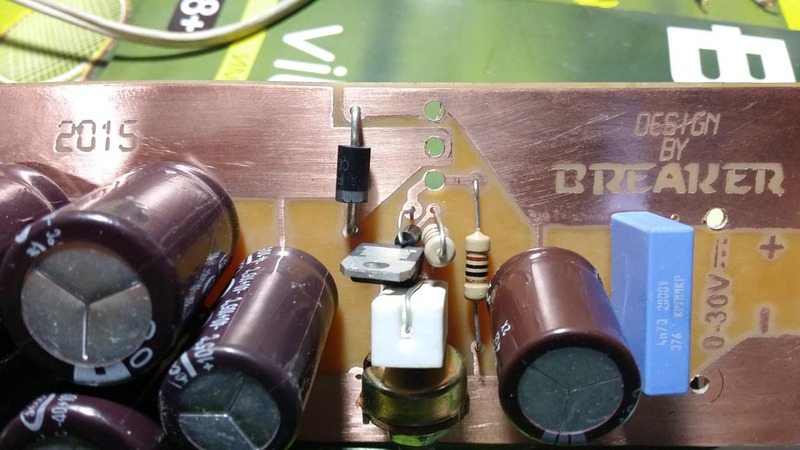 The output range is still 1-30v, and the power transistors may generate a little bit more heat with a higher voltage supply. 2. 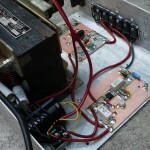 I installed a 35A bridge rectifier instead of the MB252. 3. 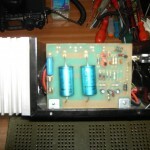 I used a 27,000µf 50v capacitor in place of the 15,000µf 50v, again because I already had it on hand. 4. I went with 6x of the TIP3055 instead of 3x 2N3055. Same transistor in a different package. 5. Instead of connecting the ADJ portion of the LM317 to the transistor emitters, I had to connect it to the output of the LM317. For some reason, when connected to the emitters the output voltage would only go between 8-30v with no load, and only 1-12v with even a small load. 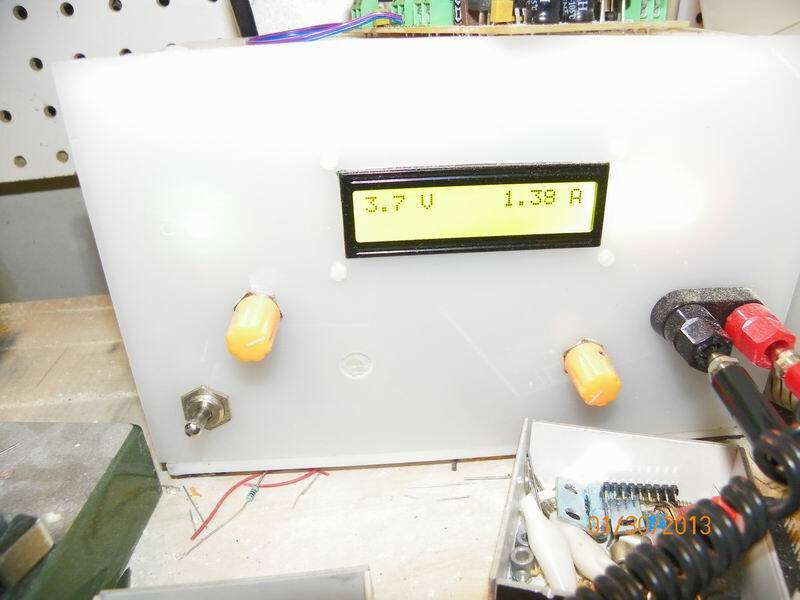 When looped to the LM317 output, it will properly range between 1-30v with or without a load. 6. I upgraded the 50 watt, 0.1 ohm resistor to a 100 watt. 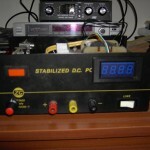 Hi, can anyone tell me how much current johns variable voltage/current psu can supply. 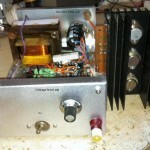 Short answer, John’s supply is capable of about 20 amps if built to his exact specifications. 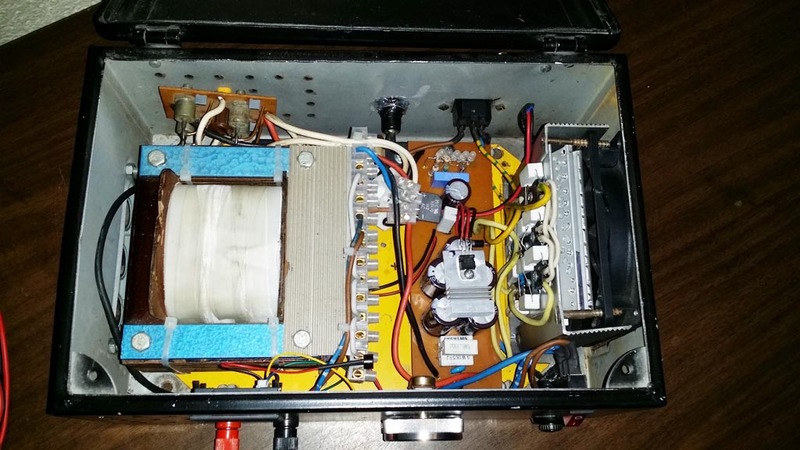 The current available from John’s version of the supply will mostly be dependent on the rating of your main transformer, bridge rectifier, output transistors, final output resistor, and heatsink capacity. 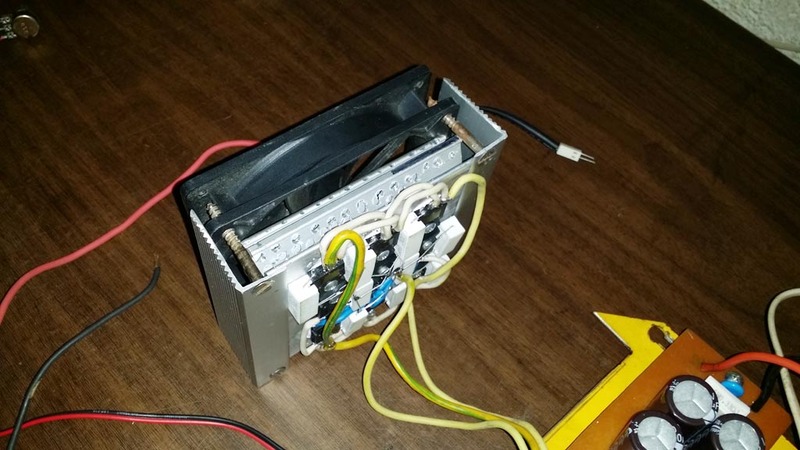 Main transformer: Should be obvious, the main transformer will need to be able to supply the current your power supply requires and maintain a reasonably constant voltage. 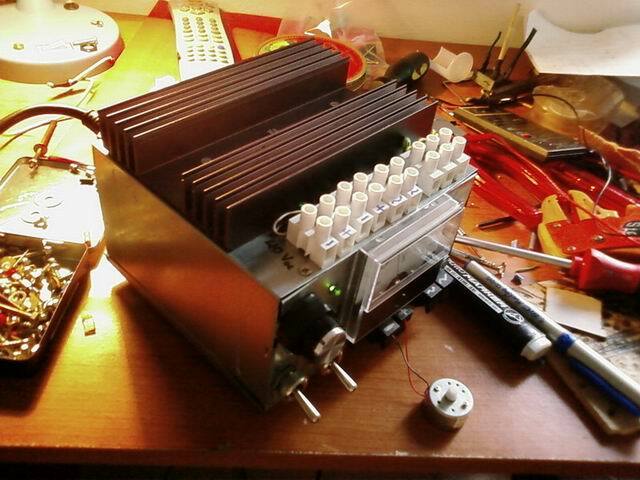 Bridge rectifier: This will need to match or exceed the current requirements of your supply. 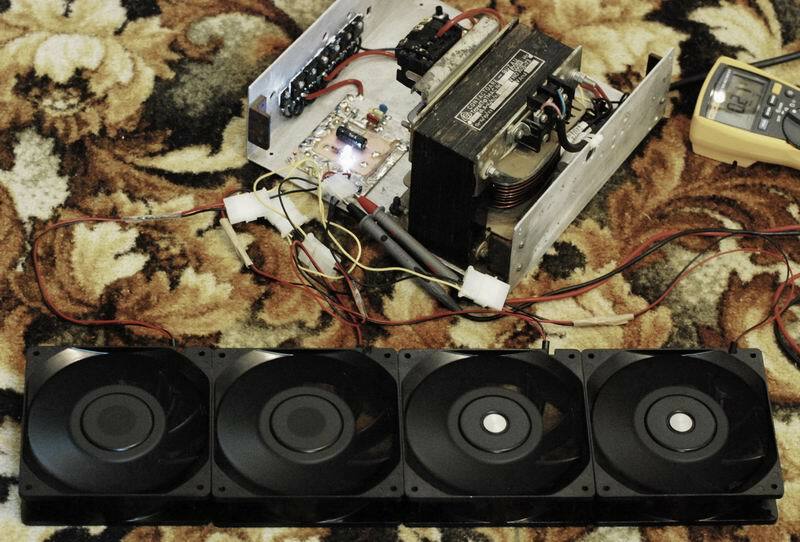 It will likely need it’s own heatsink, as it will dissipate quite a bit of heat at higher currents. 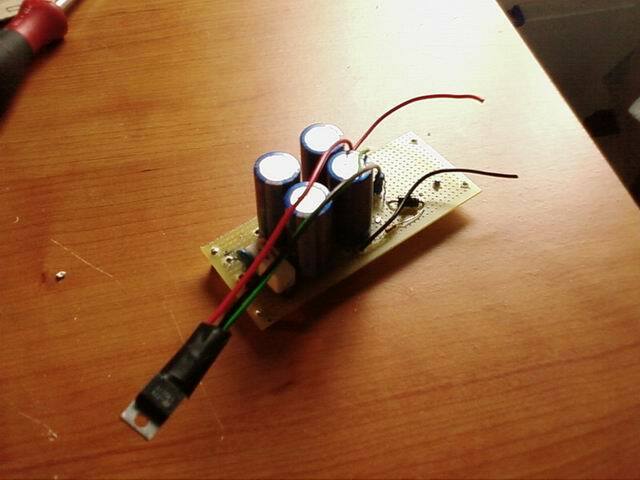 Final output resistor: By fundamental design, a 50 watt 0.1 ohm resistor will limit this supply to a maximum of 22 amps. The power rating of this resistor must be increased for higher current. Alternately, you could use two 50 watt 0.2 ohm resistors in parallel, or any equivalent configuration. 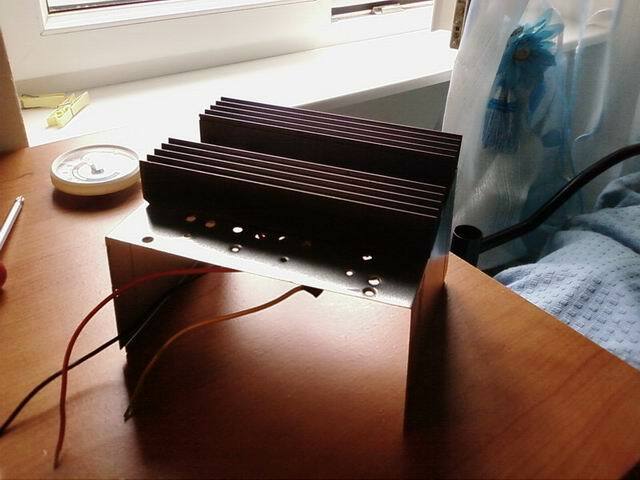 Heatsink capacity: Bigger heatsinks and increased airflow will be required for high currents at lower voltages. 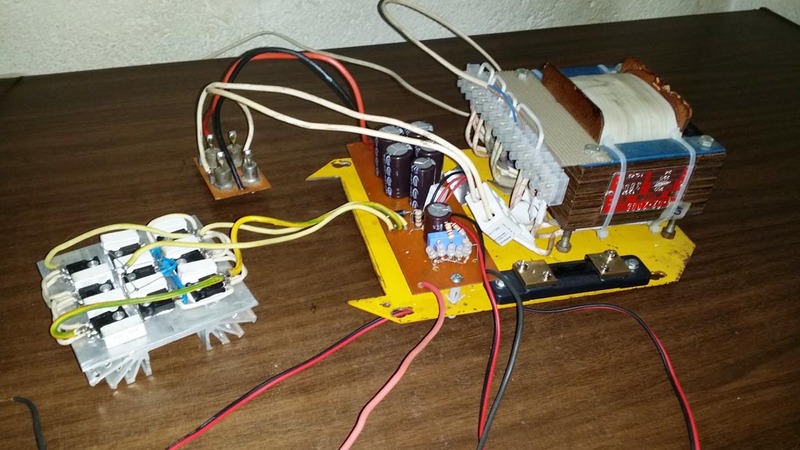 Since linear power supplies are very inefficient, the extra energy left over after the voltage is reduced across the transistors is wasted as heat. For example, If you are trying to pull 30 amps and 12 volts out of the supply, and your main voltage is 32 volts, 360 watts goes to your load, and 600 watts is dumped into the heatsink! 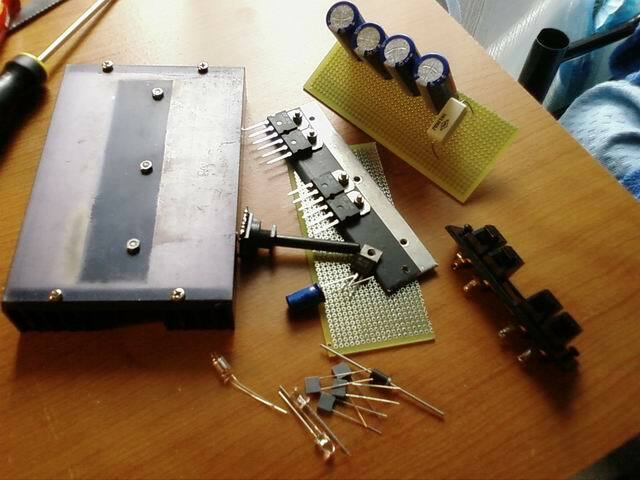 I built the LM723 variant based on Johns schematic, metalwork is not finished yet, but the PCB is tested now. on the schematic mention some kind of “folding back”. 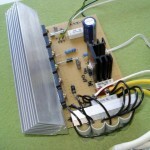 It is a conventional constant current limitation. the minimum value of the current limitation is about 4.4A in the original design (up to 40A max., not tested). So no effect was noticed because the supply voltage did not exceed 2.5A in my tests. I have made some changes to the schematic to ease meachanical construction and improve the current limit. is set to 10A. 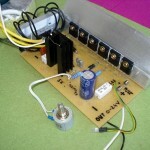 I use 4 power transistors (TIP3055) instead of 3.
to drive the base of all TIP3055. TIP3055 has a TO-214 package. 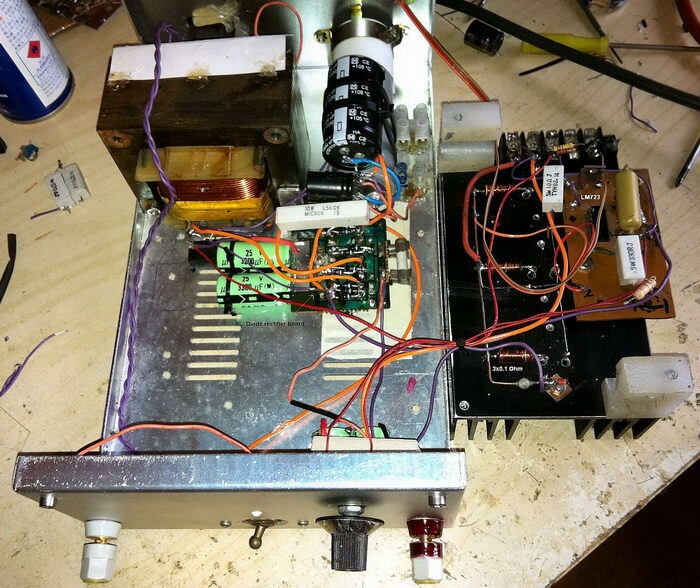 TIP3055 and MUR1520 has the collector connected to the case, the resistor is isolated. This allows to mount all parts without isolation on the heat sink (better heat conductivity, the heatsink must be isolated against ground though). – Changed the current sense resistor from 0R15/50W to 0R33/50W to reduce the lowest current limiting value to 1.96A. 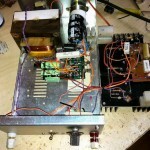 – Increased the 100R resistor in the current limitation to 200R for max. current limit of 10A. I’m still not satisfied with the lower current limiting setting. I would appreciate it at ~20mA not 2A. this would cause a reasonable voltage drop in the power supply, which is not acceptable. Is there any experience with this kind of power sensing? Examples in the net showed tendencies to oscillate then, but this were other schematics as well. Is there any other (more convenient) way to implement current limit down to approx. the mili-amperes and up to Amperes? I will post an updated schematic as soon as the design is fixed. 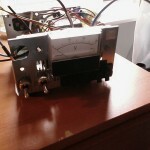 I just finished the power supply posted by RAdu, but I have a problem with VA meter …the voltage is not going to 0 with potentiometer at minimum…the VA meter ( http://www.aliexpress.com/item/2in1-DC-Volt-Amp-Dual-display-Meter-0-100V-100A-DC-Digital-Voltmeter-Ammeter-LED-Amp/1899591208.html ) show me around 15 volts without load…this is going to minimum just if I have load at output ….So, with load, conected everything is ok and the voltage increase and decrease ok by moving the pot….without load ,reaing voltage is at around 15 v…. what is wrong with my setup? I had the same issue of runaway output voltage under zero load, but this seems to be a common problem on linearly regulated power supplies. On another design it helped to add a 4k7 Resistor as a dummy load. On this (John’s) design, I needed a much lower resistor (roughly 470R as far as I remember) to keep the voltage from fading. 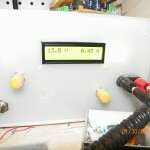 Give it a try and keep in mind that quite some heat (>0.1W) must be absorbed under full (30V) voltage. I had some problems to make this (Johns version with LM723) stable. 2) The current limit sets in on 4.4A on its lowest limit. With higher resistance of the current sense I got too high output impedance of the power supply, so I tried comparators (LM393) and the LT1789-1 instrumentaion amplifier to boost Pin 2 input, but with no success. The slow input amplifier combined with the fast LM723 curent limiter always ended in a heavily oscilating curcuit. 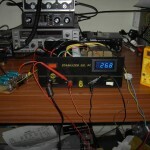 To adequately face the fast LM723 I tried to boost Pin2 voltage with the voltage drop from a constant current source, which is common practice in older low cost power supplies of the LM723-era (see http://www.electro-tech-online.com/attachments/adjustable-30v-lm723-power-supply-circuit-jpg.68788/ ). After several days of tinkering and twiddling I handend this over to the trash and started over with this design http://www.hpm-elektronik.de/nt30-15.htm which is more mature and more complex, but working. 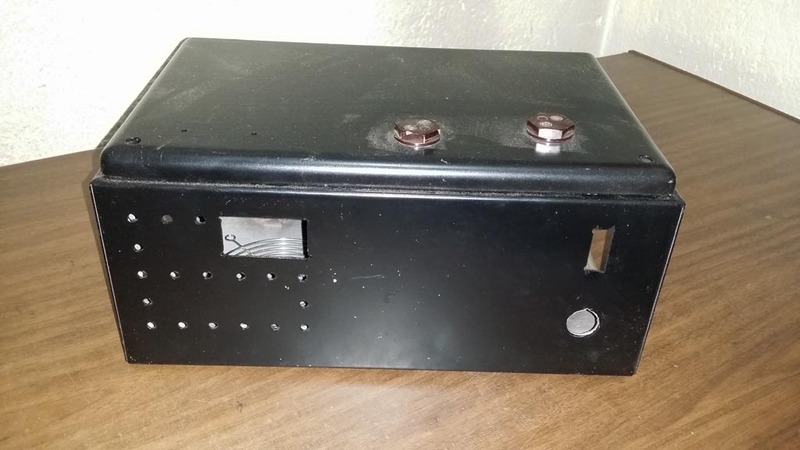 I don’t want to talk down the design presented here, but just in case anyone is searching for an accurate laboratory bench power supply, this might be the wrong approach, despite its tempting simplicity. After all the new start was worth it an runs stable just after assembly. 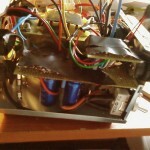 I have described the shortcomings a little bit deeper on my homepage (http://www.dt-invent.de/content/powersupply_30V10A/powersupply_30V10A.html , work in progress) if someone is interested. and once again, thanks to Radu for sharing. one additional note to the display sinergicus used. I used a similar one 0-30V, 0-10A, same design, probably same chinese producer. I would not buy it again (although 10€ is a bargain). and this means you can not place the I and U gauge independently in your schematic. 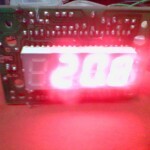 This results in the internal voltage drop of the current-measurement being added to the voltage value on the display, and you can not change it. My (10A) version does not have an external shunt and the voltage drop is 200mV at 10A which is quite a bit. The display remains at 9.80A for I>9.80A with my 10A version. Otherwise, if you don’t mind, its working good. 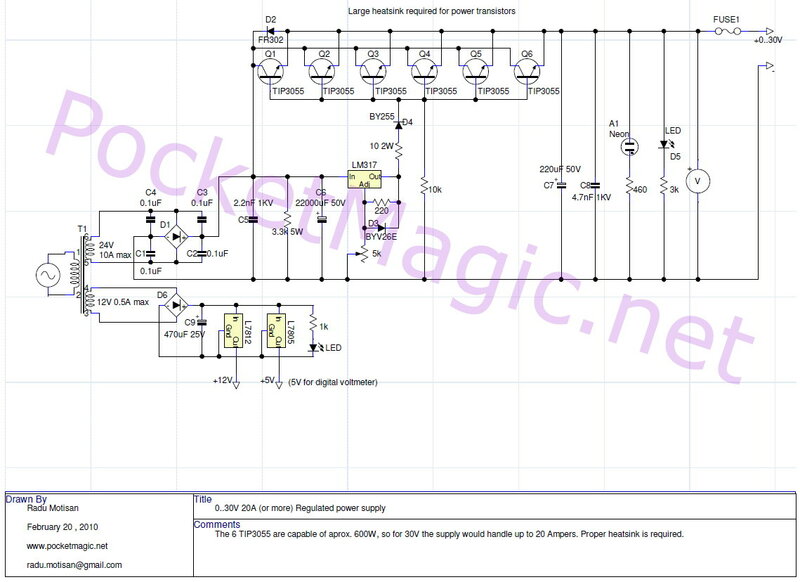 I did not have time to read all the comments in detail, but like to mentioning that the LM317 and its higher current brother the LM350 are floating regulators and can be used to stabilize any voltage up to several thousand volts if needed. 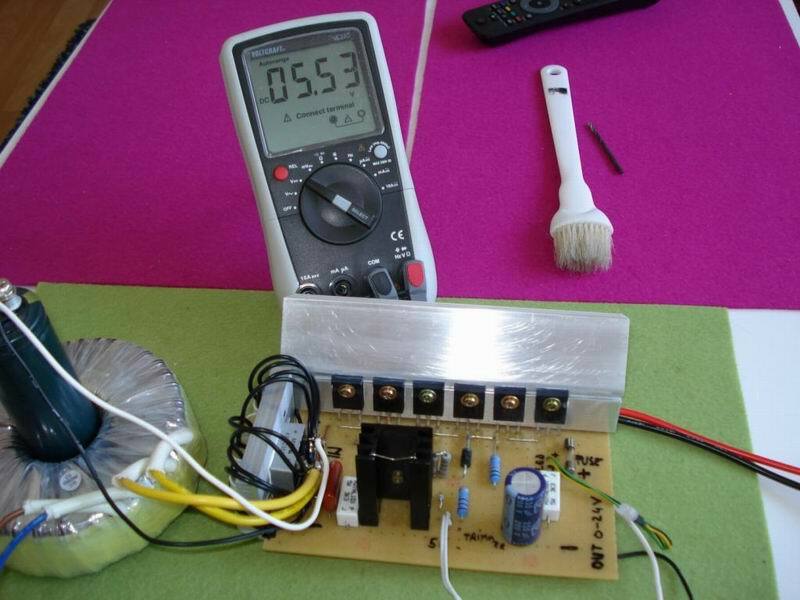 The only criteria is that the INPUT to OUTPUT voltage doesn’t exceed 35volts. So, it is no problem to stabilize a 300V supply as long as the input voltage is not larger than 335V. Of course the resistor to ground has to be larger and able to withstand not only the voltage but be off adequate wattage to do the job. I have successfully used the IC for screen supply stabilization at 450V and also have used it to build a 48V@40A supply for a high power transistor amp. The best way to use this IC in a high current supply is to use a PNP transistor like the 2N5684. 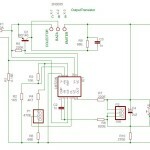 The circuit for the use with one or more pnp transistor is well published. It has better regulation than using it the way you did where the base emitter junction of the transistor is a variable the IC is not seeing in its attempt to regulate. There are 2 main reasons the 2n3055 transistors ( essential the same as the mj3055 only different case) fail. First you don’t have equalization resistors in the emitters… an absolute must for current sharing. A 0.01 ohm 5w resistor is all that’s needed to make sure all transistors share the current. Otherwise one or two will do all the work and the rest sits idle by causing a failure of the supply because of the over dissipation of those transistors. The second reason is that you need to have a resistor between the base of each transistor and the OUTPUT. This can be after the EQ resistor on the output so if all bases are in parallel (forget the individual diodes driving each base, they are not needed) you only need one resistor. Typically between 360 and 680 ohms at one watt will do. I have used 1kohm before successfully if the transistors were robust enough. Thanks John. Indeed this (old) circuit needs an update. I got to learn more during all this years. Time is the only problem, but I plan to get back to this article and do a new circuit. My supply needs to be fixed, and that would be a good time to cover all pending issues. 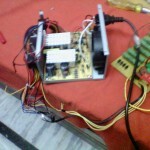 I have built PSU using John’s schematics with LM317, but I can’t make it work properly. Whatever I try, I get some 15.3V at the main output, although I have some 4-5V on LM317 output pin (can’t get more in this configuration). I have also tried to connect this circuit as on the first schematic, and still have always the same 15.3V at the main output, but then I can regulate output at LM317 output pin as expected (up to 14V, due to R/POT combination). Does anybody have a clue what is going on? Here is my schematics, I added two diodes to protect IC, and one .1R to protect from short circuit at the output. 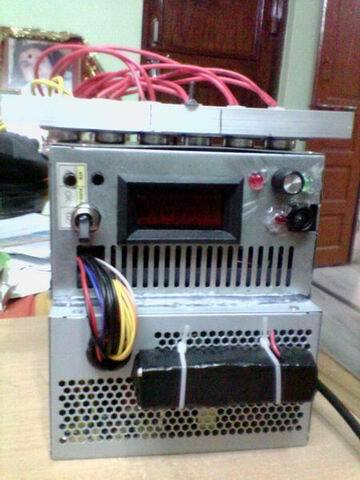 I have used 35v 20 am out put transformer it is right . 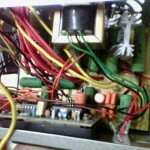 some time when amp rise up to 8 A. some transistors B and E short circuit.. Please help me thanks in advance.